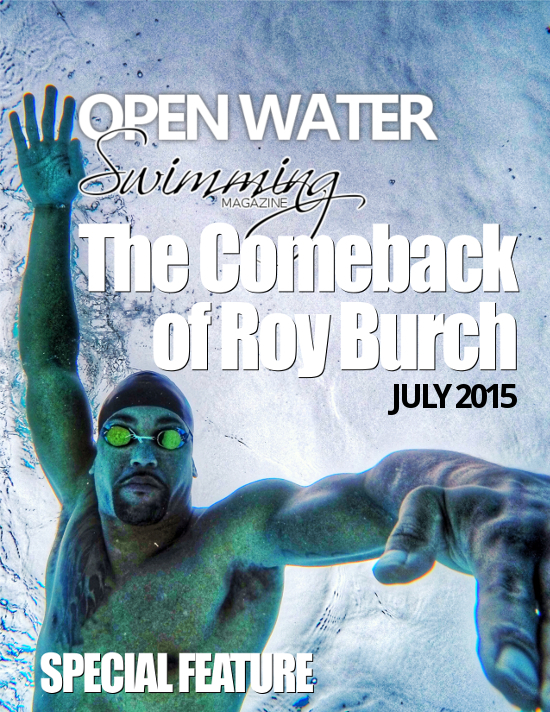 Photo courtesy of Peter H. Bick for Swimming World Magazine. 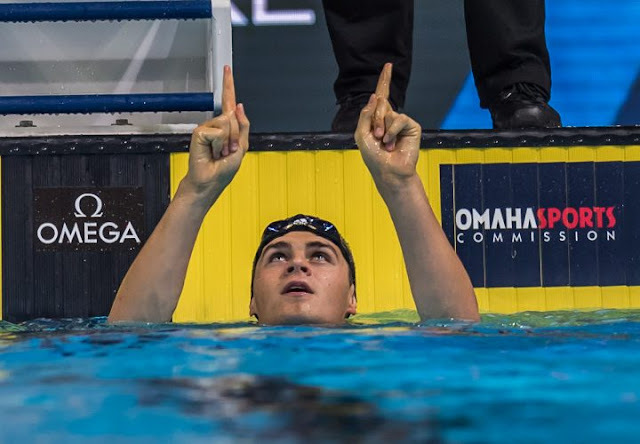 Michael Andrew, a phenomenal 17-year-old from Kansas won his first world swimming title yesterday in Canada in the 100m individual medley at the 2016 FINA World Short Course Swimming Championships. Coached by his father, Peter Andrew, Michael uses blood flow moderation training with KAATSU Cycles and KAATSU Training on his KAATSU Master unit. The Andrew's use of KAATSU is illustrative to what is recommended to aquatic athletes and their counterparts on dryland, using either a portable KAATSU Nano or a larger KAATSU Master. (a) warm-up with KAATSU Cycle with an appropriate Base SKU and Optimal SKU levels 2-3 times on both arms and legs. 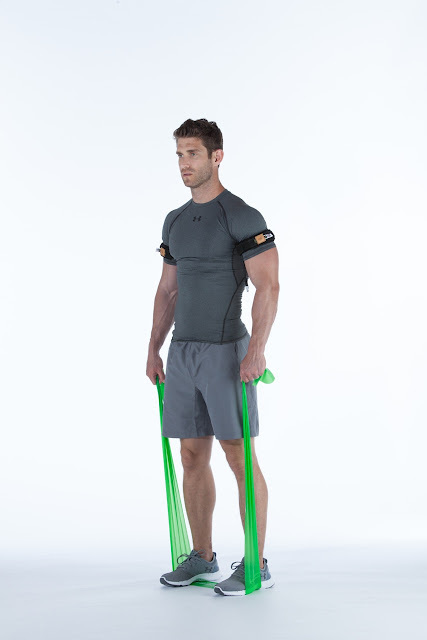 (b) a wide variety of body-weight exercises and resistance band exercises, along with use of ergometers with the KAATSU Arm Bands (and separately with KAATSU Leg Bands), always going to either muscular or technical failure generally in sets of 3-4. (a) swim short sets of sprints (8-12) of 25-50 yards or meters with 20 seconds rest between, ideally performed at the end of practice. (b) after the KAATSU swim sprints are completed, remove bands and loosen down a bit (100-300 meters) and then do one last all-out sprint. The athletes usually feel strong and swim outstandingly fast. (a) swim short sprints (15-25 meters) and agility drills that should be performed with a strong kick. (b) practice race starts (3-5). (c) practice race-pace breakouts and turns. (a) Use KAATSU Arm Bands or KAATSU Leg Bands (on alternate days) during shooting drills for water polo players. (b) Use KAATSU Arm Bands or KAATSU Leg Bands during swimming technique drill sets (on butterfly, backstroke, breaststroke or freestyle). The athletes usually feel an enhanced tactile feel in the water as a result. (b) Use KAATSU Leg Bands during kicking sets for swimmers, especially intense when using fins, or during eggbeatering drills that are especially important for goalies. (a) Conduct warm-up on dryland with "light" KAATSU Cycles before a game/swim meet or between games/swims on multi-game tournaments or multiple swims during one day. (b) Do KAATSU Cycles (Cycle 20) between prelims and finals at the hotel or home. (a) Warm-down with "light" KAATSU Cycles after a practice/game/swim meet in order to recover well for the next day. (b) Do KAATSU Cycles (Cycle 20) after finals in the evenings in the hotel/home in order to recover well for the next day of competition. (a) Stretch on dryland with KAATSU Cycles in order to increase range of motion. (b) Stretch in the water with KAATSU Arm Bands or KAATSU Leg Bands on in order to increase range of motion. (a) Perform KAATSU based on the advice of a physician, physical therapist or trainer. To research Frequently Asked Questions about KAATSU, visit here. Copyright © 2014-2016 by KAATSU Global, Inc.
Ice hockey players or those who enjoy ice skating for fitness or performance can use the pneumatic KAATSU Air Bands monitored by the KAATSU Master or KAATSU Nano and inflated to their Optimal SKU (pressure). They can do a variety of exercises. 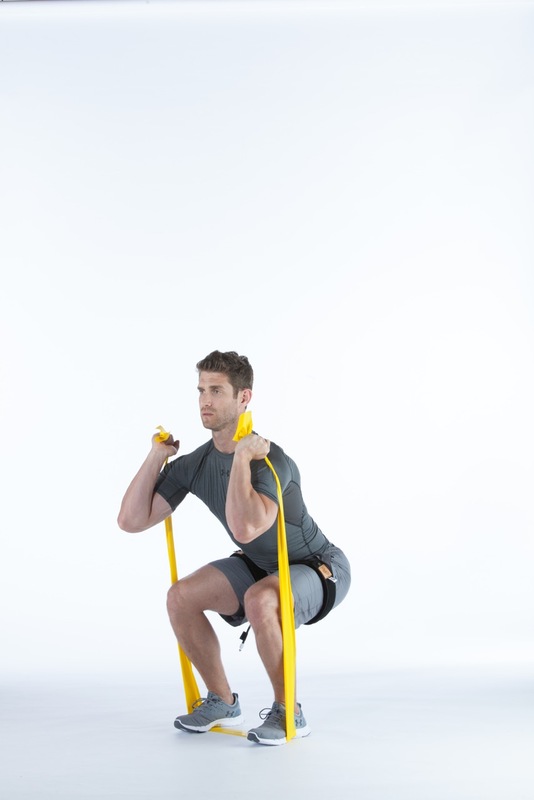 We recommend that they do 3-4 sets of each exercise that is performed to either muscular or technical failure. If the Optimal SKU is set correctly, the duration (or repetitions) of each set should be reduced. That is, if set #1 is 1 minute in duration (or 30-40 repetitions), then rest for a maximum of 20 seconds and continue with set #2. KAATSU users should reach their muscular or technical failure before 1 minute or 30-40 repetition in Set #2. Rest should be no more than 20 seconds before set #3 begins. In set #3, KAATSU users should reach their muscular or technical failure in a shorter time duration or fewer repetitions in Set #2. After 1-2 KAATSU Cycles (Cycle 20 is a great warmup for non-athletes or Cycle 60 for high-level athletes) and perhaps after completing the standard KAATSU 3-point exercises (i.e., hand clenches + biceps curls + triceps extensions), try to do the KAATSU Push-up Challenge (i.e., three sets of push-ups with your Optimal SKU levels in the KAATSU Air Bands). Do the first set of push-ups until you reach muscular or technical failure. Ideally, your Optimal SKU will allow you to do between 25-40 push-ups. Then rest 20 seconds and start your second set of push-ups. Do the second set of push-ups until you reach muscular or technical failure. Ideally, if your Optimal SKU is set properly, you will not be able to repeat the same number of push-ups in the second set as you did in the first set. You may be able to do only 10-20 push-ups on the second set. This is OK and actually exactly what you want. Then rest 20 seconds and start your third set of push-ups. Do the third set of push-ups until you reach muscular or technical failure. Ideally, your number of push-ups will decrease again. This indicates you have set your Optimal SKU. 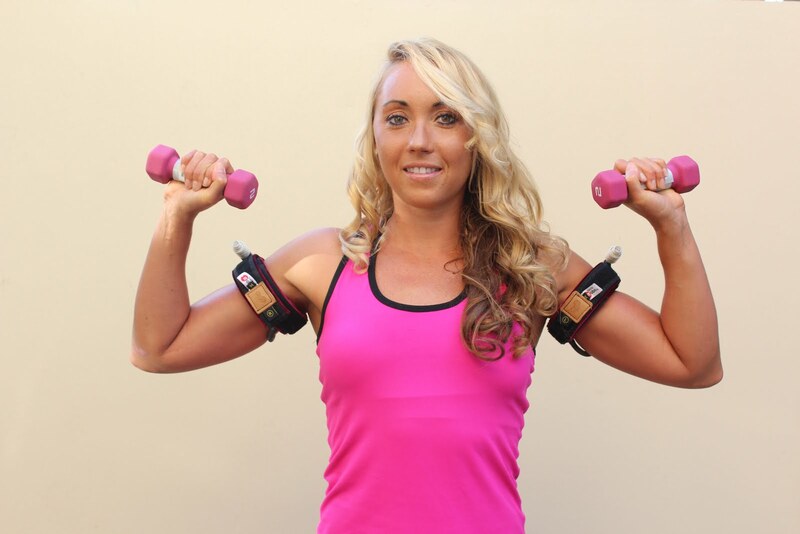 This is a great way to build strength and develop tone in your upper body. Copyright © 2016 by KAATSU Global, Inc.
Sprint butterfly + pull-ups + pull-outs + push-ups with the pneumatic KAATSU Aqua Bands are notoriously difficult. 8 x 25 with 5 pull-ups and 10 push-ups are extraordinarily tough. 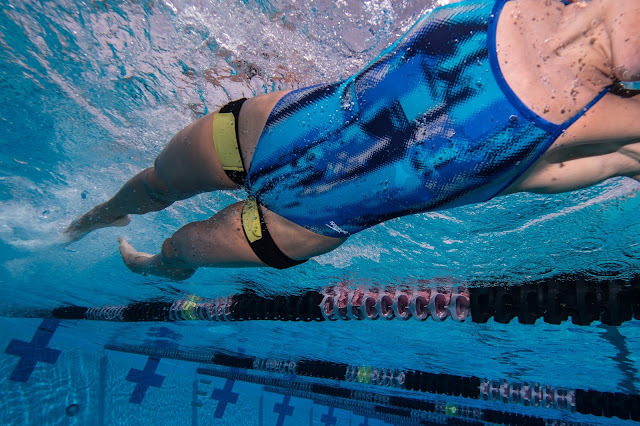 Competitive swimmers, open water swimmers, water polo players, triathletes, surfers, and other watermen and waterwomen can use KAATSU Aqua leg bands to enhance speed, stamina, strength and "feel" in the water. Aquatic athletes can pull a parachute with KAATSU Aqua Bands to enhance speed, stamina, strength and "feel" in the water. Using the pneumatic KAATSU Aqua Bands by identifying the appropriate Base SKU (compression) and inflated Optimal SKU (compression), swimmers, water polo players and triathletes and everyone from those rehabilitating to individuals simply focused on fitness can really work on their core in the water. Using the pneumatic KAATSU Aqua Bands in the water and the KAATSU Nano or KAATSU Master on the pool deck, individuals of any ability or any age was do blood flow moderation training for speed, stamina, strength or flexibility. Long Beach (California) firefighter Mitch Berro trains with KAATSU Aqua Bands by pushing off bottom of pool holding a weight. Training with KAATSU Aqua Bands by eggbeatering in a pool while holding a weight. Use a kickboard, use fins, do vertical kicking, or other moves to highly stress the legs and core. Pull along a parachute to add stress to your KAATSU Swimming. The pneumatic KAATSU Aqua Bands add stress to sculling in the water with or without hand paddles. 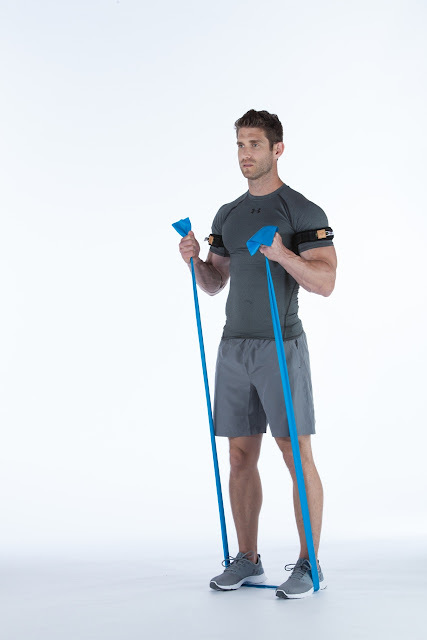 The pneumatic KAATSU Aqua Bands can help strengthen triceps with triceps extensions in the water with or without hand paddles. The pneumatic KAATSU Aqua Bands can be done while swimming, kicking or pulling butterfly, backstroke, breaststroke or freestyle, or while shooting a water polo ball or doing aqua-therapy, aqua-walking or aqua-jogging. KAATSU Aqua Walking for those undergoing aqua-therapy or rehabilitation. 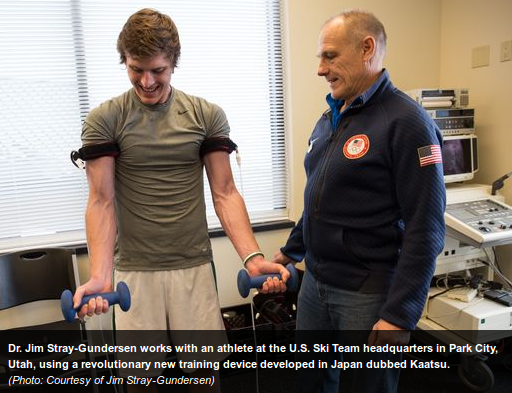 Dr. James Stray-Gundersen of the United States Ski & Snowboard Association explains the local and systemic mechanisms of KAATSU Training that is used by elite professional and Olympics athletes and non-athletes alike. 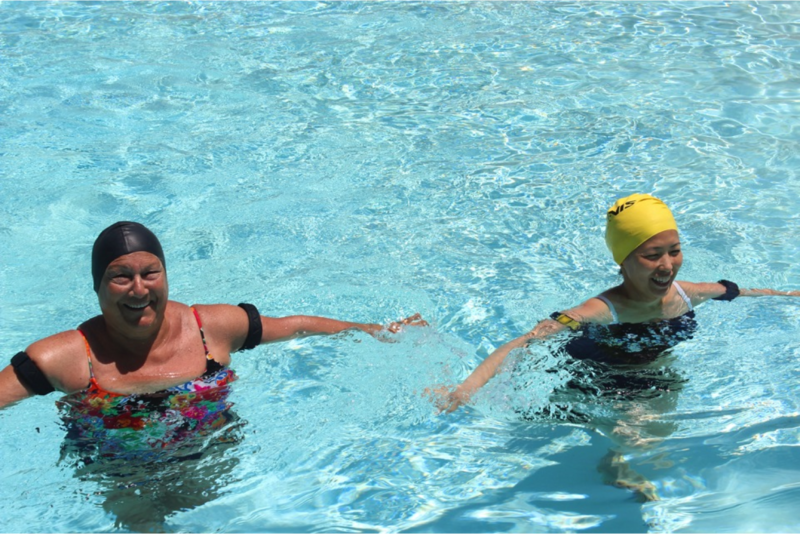 KAATSU Aqua Bands can be used differently depending on whether the bands are used for with masters swimmers or fitness swimmers or competitive elite swimmers. In general, the more competitive the swimmer, the higher the pressures. But finding the Optimal SKU (compression) is a function of many factors including whether the bands are on the legs or arms, the percentage of body fat, the tolerance level of high lactate levels, and the amount of experience using KAATSU. 1. Because the body is in the horizontal position while swimming and the body is floating in the water. Therefore, the relative pressure within the veins and capillaries are greater in this situation than on dryland, especially while swimming quickly. 2. Swimming is an activity where breathing is different and less efficient than on land. That is, even great swimmers breathe differently while swimming than while exercising on land. Therefore, there is an even greater hypoxia in the limbs in the water than on land. 3. Swimming is an activity where there is almost never a "pumping out" of the lactate like there is with exercises like biceps curls. In other words, when the athlete is correctly doing biceps curls with KAATSU Air Bands on land, the limbs become saturated with blood and lactate. But the pumping action of the curls naturally forces some blood and lactate out of the muscle, past the KAATSU Air Bands. But when one is swimming freestyle, backstroke or butterfly, this "pumping out" of the lactate does not occur so effectively. The arms are simply swinging around the body (over and below the water surface) in a rather static position. Therefore, more lactate stays in the muscle...and therefore discomfort comes earlier. 4. Because swimming is such a technical sport, even slight changes in the head or body or knee or elbow positions can dramatically change the speed of the swimmer. So when the swimmer starts to feel the lactate building, their technique quickly deteriorates and speed significantly decreases. Coaches want their swimmers to swim with as best technique as possible. Therefore, swimming with KAATSU Aqua Bands is generally and best limited to 25-50 meter distances - performed at top speed and with as best technique as possible. Swimming sets for competitive elite swimmers can be done towards the end of their workouts and can be limited to breakouts (10-15 meter practices of turns off the wall), 25-meter or 50-meter swims of high intensity. * 10 x 40 swims in a 25-yard or 25-meter pool where a strong pace is maintained for the first lap followed by a strong turn and breakout. Swim easy to the wall after the breakout. * 5-10 x racing starts with KAATSU Aqua Bands or until technical failure is reached. Followed by 2-3 racing starts without bands. 1. The sets can be done alternatively with the arm bands and leg bands on alternative days. 2. If there is sufficient time within a workout, the sets above can be done first with the arms bands and then with the leg bands. 3. 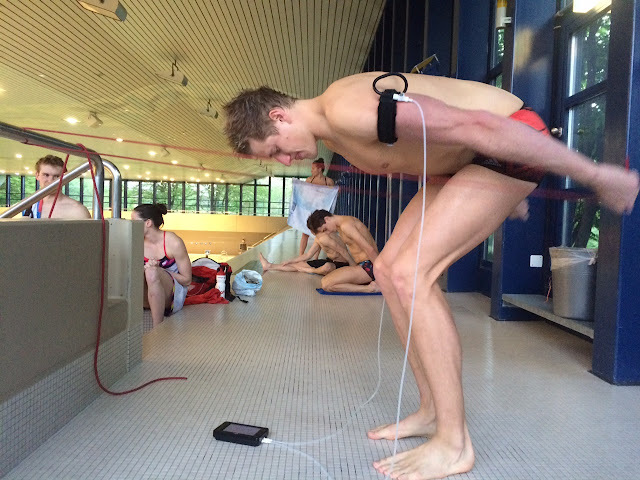 In each set, each swimmer should swim with their own Optimal SKU. 4. The swimmer should take additional rest and/or temporarily release the air in the KAATSU Aqua Bands when technical failure is reached (where technical failure is judged by a breakdown of proper swimming technique). Chris Morgan, a 2008 Olympic swimming coach, teaches and advises a number of athletes about KAATSU training on dryland and KAATSU Aqua in the water from Olympic swimming medalists and Olympic Trials finalists to masters swimmers (24- 75 years), competitive age group swimmers and collegiate swimmers. 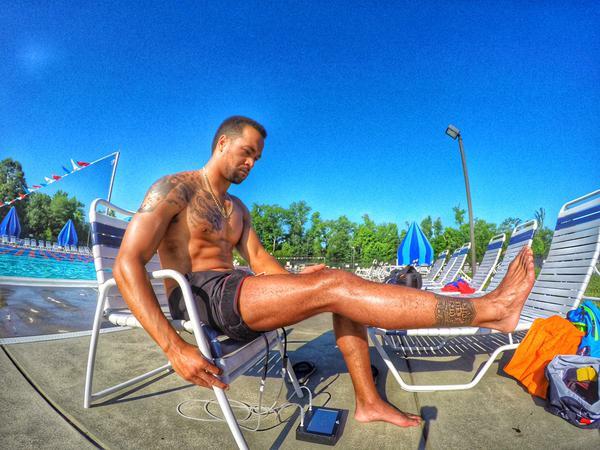 "KAATSU Aqua is beneficial for those athletes aiming for the 2020 Tokyo Olympics and non-athletes recovering from injuries," says Morgan who explained how Roy Burch used KAATSU to recover from a double patella tendon rupture and qualified for the Olympics. Morgan [see video below] explains, "We work on speed, strength and stamina every workout at the Gator's Swim Club in Waltham, Massachusetts [the 2015 New England Senior Swimming Championship Team]. Like other competitive age-group swim teams, we augment those hard training sessions with a focus on proper technique, good balanced nutrition, and all kinds of 'outside the box' dry-land training. This year, our athletes began an innovative addition to our entire training regime that has resulted in some unprecedented drops in time." KAATSU is the advantage that Olympic and professional athletes from Japan, and increasingly in teams from the United States and Switzerland to Tunisia and Hungary, have been using to gain specific strength in order to improve speed and increase stamina. Morgan continues, "Years ago, Olympic champion Misty Hyman from Stanford University did something vaguely similar. The 200-meter butterfly Olympic champion in the 2000 Sydney Olympic Games placed several thick postage rubber bands around her arms and legs. She would at times swim as much as 8,000 meters with the bands at AFOX in Arizona under the guidance of its coach Bob Gillette as a high school student. Her unusual training method started in Arizona as a top age-grouper and continued at Stanford University under Richard Quick - where I served as an assistant coach. But we learned from Dr. Yoshiaki Sato and our KAATSU Global colleagues that very specific pressures with carefully engineered pneumatic bands used in short durations is the key to significant improvements in speed, strength and stamina. We use the KAATSU Master and KAATSU Nano devices to identify two types of specific pressures (called Base SKU and Optimal SKU where SKU stands for Standard KAATSU Unit). These pressures are specific for each athlete that can vary from day to day and workout to workout. Those specific pressures, that vary from athlete to athlete, are how our athletes have maximized the benefits of KAATSU or "blood flow moderation training." Invented in 1966 and perfected by 1973 by Dr. Sato of Tokyo, the KAATSU inventor was honored by the Japanese Olympic Committee in 1992. Word eventually leaked out from Japan about KAATSU beginning in the 1980s and throughout the 1990s, but it was mostly adopted without knowledge of the Base SKU and Optimal SKU, the smart pneumatic bands, or the use of the KAATSU Cycle protocols by the bodybuilding community. These bodybuilders, looking to achieve muscle hypertrophy, never understood the existence of pneumatic bands that maintain its structural integrity as they inflate, or the importance of identifying one's Base SKU or Optimal SKU, or integrating the KAATSU Cycle protocols as a means of post-workout recovery. Eventually, the bodybuilding community resorted to using knee wraps and other sorts of restrictive, occasionally non-elastic, bands as occlusion training or tourniquet training tools. But acceptance of the thick postage rubber bands or knee wraps never took off in amateur or professional sports in the West, especially in the aquatic community. But for years and even a cursory search on Amazon, a growing number of American and European bodybuilders and trainers simply tie knee wraps and other bands around their arms in order to build bulk based on information they learned from the Internet and two-dimensional photos they saw of KAATSU bands. 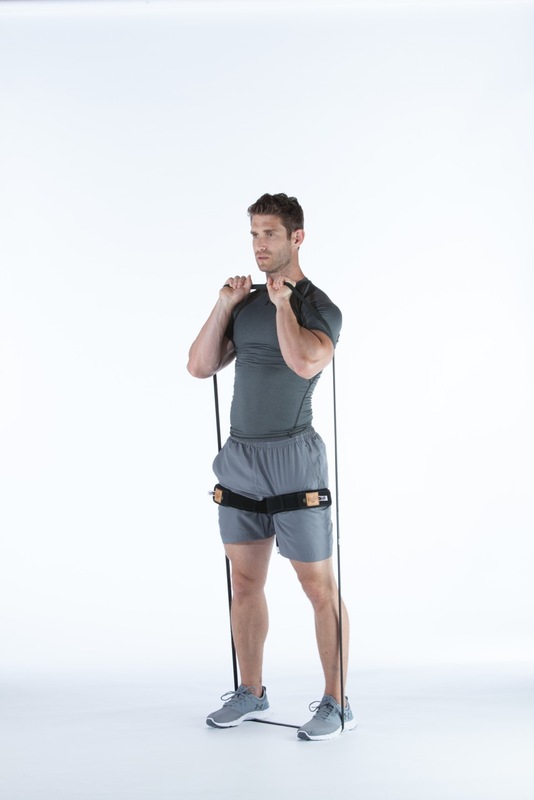 In contrast to the specific KAATSU protocols to identify optimal pressures, bodybuilders tie their limbs with occlusion bands using a pain scale from 1 to 10, with 7-8 being the recommended level of pain by various American researchers and strength coaches. This kind of simplified and frankly dangerous* means to occlude blood flow in the limbs was neither possible nor practical for age-group swimmers or older masters swimmers. "Or frankly, anyone," reminds Morgan. "In contrast to those focused on muscle hypertrophy, we wanted a proven, safe and effective means to help our young athletes improve their speed, strength and stamina - not a means simply to get bulkier. Since the Center for KAATSU Research at the Harvard Medical School was established in 2013, I first used KAATSU on myself** and learned the proper protocols and how to safely use the KAATSU equipment. With that knowledge and experience, the athletes of the Gator's Swim Club have been experimenting with KAATSU and our age-group swimmers, several who are national-caliber swimmers. I quickly learned how we could replicate 'race pain' without the need for a time-consuming test set by using the KAATSU equipment. By engorging the muscles in blood - instead of keeping blood out like the bodybuilders and their knee wraps, I studied how this revolutionary training technique could be utilized by competitive swimmers whether they are focused on their local high school championships and getting into college or others like Roy Burch and Mohamed Hussein who qualified for the 2016 Rio Olympic Games." "We use the KAATSU Cycle modality between races and between the preliminary and final events in a multi-day event (e.g., the 2015 Winter Junior National Championships in Atlanta, Georgia) and KAATSU Cycle has been used at the World University Games and United States Olympic Trials in both swimming and track & field." "We do a variety of sets with KAATSU in order to improve technique, speed, strength and stamina. None of these sets last over 20 minutes, as per the standard KAATSU protocols. Some of the sets involve using arm bands and some of the sets involve using leg bands, including sets that exclusively focus on starts or turns. These sets can range from 10 x 15m breakouts to 10 x 50 at a specific pressure. 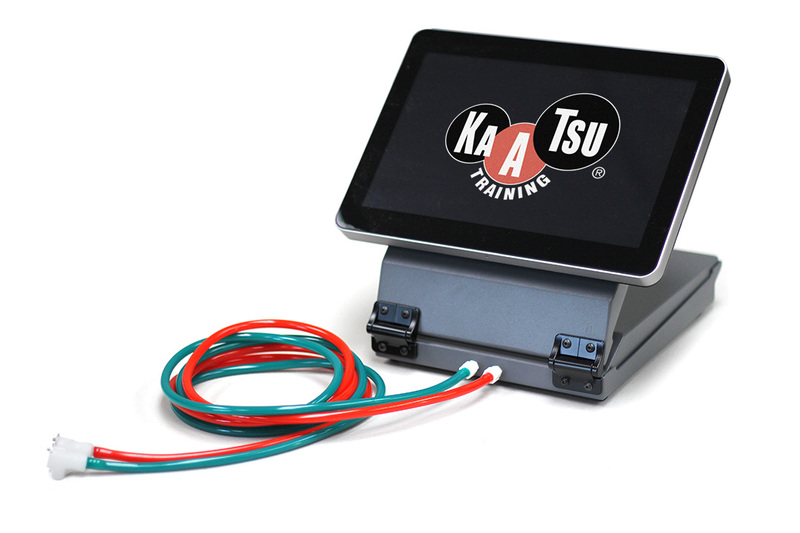 Not only have our athletes and their parents accepted KAATSU and appreciate its benefits, but we also have some of our graduating seniors requesting the KAATSU machines accompany them to their new collegiate teams." ** In 2013, Morgan competed in a Tough Mudder obstacle race near Boston. He used the KAATSU Master to improve his fitness level, but on the day of the event, at mile #10, he slipped on a log, smashed his side, and broke 2 ribs. For 7 days immediately after the injury, he used the KAATSU Master and KAATSU Air Bands as prescribed for broken bones. 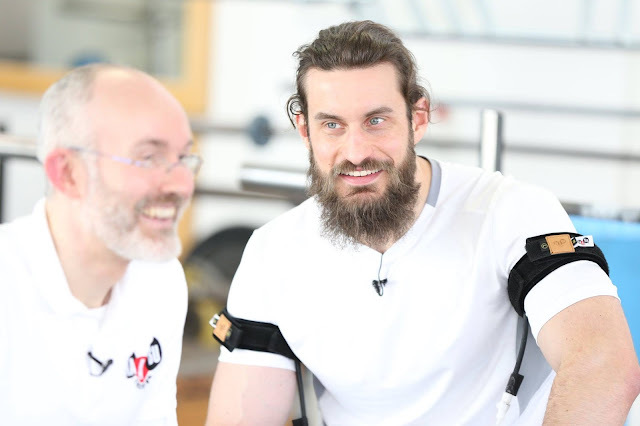 By day 7, the pain and sensitivity of the broken ribs had vanished. Ten days after the first x-rays revealed the broken ribs, he took a second set of x-rays at Harvard University that showed a complete recovery. "Ever since that time, I wanted the athletes who I work with to benefit from a clear and methodical use of KAATSU." World championship bronze medalist and two-time NCAA wrestling champion Andre Metzger describes how KAATSU helps his collegiate wrestlers make weight before their bouts. 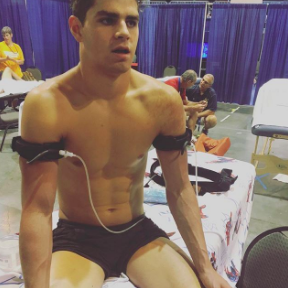 Metzger uses a KAATSU Nano and KAATSU Air Bands on his wrestlers' arms and legs (separately) with the appropriate Base SKU (compression) and Optimal SKU (compression). Whether an elderly person is recovering from a knee replacement or an Olympic athlete is rehabilitating from a double patella tendon rupture, KAATSU can be comprehensively incorporated into their recovery. After the individual identifies their appropriate Base SKU, they can do a series of KAATSU 3-point exercises first on their arms and then on their legs. This can begin as early as 72 hours after surgery or as soon as their physician gives them the green light to begin. KAATSU on the arms should always be performed first and will help initiate the positive system effects of KAATSU. The KAATSU 3-point exercises on the arms include three sets of hand clenches, three sets of biceps curls, and three sets of triceps extensions. 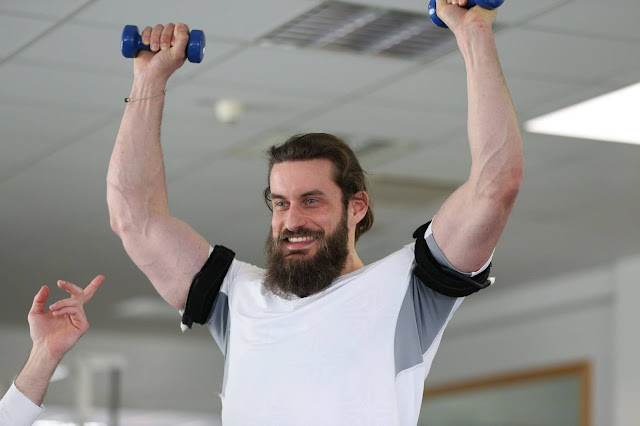 The hand clenches can be performed with standard hand grips and the biceps curls and triceps extensions can be performed either without weights or with filled water bottles, resistance bands or very light weights (>3 kg). After the KAATSU arm session is completed within 15 minutes (maximum duration), the KAATSU 3-point exercises on the legs can begin as the individual remains well-hydrated. The KAATSU leg exercises are very simple and can include 3 sets of toe curls, 3 sets of toe raises, 3 sets of heel raises (if possible), 3 sets of leg extensions (see below if possible) or 3 sets of simple quarter-squats (if possible). Even more easily and comfortably, aqua-walking in a shallow pool (>1 meter deep) is extremely effective. Each of the sets of exercises on the arms and legs should become increasingly difficult due to the lactic acid build-up. 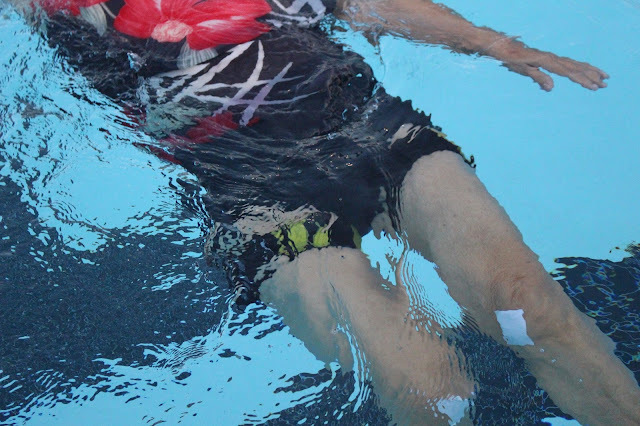 If aqua-walking or aqua-therapy is used, the KAATSU Aqua Bands should only be on the legs for 20 minutes maximum. Simple stretching in the water or walking in shallow-water pools is also very effective. For more information about KAATSU Training or KAATSU Aqua, contact KAATSU Global. For an article about use of KAATSU Aqua by Olympic athletes, visit here (Déjà Vu, Training Of Misty Hyman Redux). For an article about the use of KAATSU Aqua by a 50'ish swimmer, visit here (A Positive Mindset For Brain Surgery). For an article about hard-core aquatic training, visit here (Aquatic Equivalents Of Brutal Dryland Workouts). * always keep rest short between sets and between exercises. That is, rest 30 seconds maximum between sets or 60 seconds maximum between exercises. 2. Always start with KAATSU Cycles (i.e., 8 cycles of 20 seconds pressure on + 5 seconds pressure off). In fact, you can also achieve muscle hypertrophy doing only the KAATSU Cycles. Step 1: Start with the KAATSU Cycle at an average Base SKU and average Optimal SKU (e.g., if your Optimal SKU is 250 SKU, start with an SKU of 220-230). Step 2: Use hand grips to do one set of hand clenches until muscular failure, enabling the lactic acid to being accumulating. Step 3: Use light weights (e.g., 5-10 lbs. dumbbell) to do bicep curls slowly and deliberately until muscular failure to reached. * Note: if you can do over 60 repetitions before reaching failure, then the KAATSU Base SKU and Optimal SKU are both too low. Increase the Base SKU or Optimal SKU so ideally the number of repetitions on the first set is 30-40 repetitions before failure. Step 4: After the first set of 30-40 repetitions, set the dumbbells down and rest for approximately 15 seconds. Step 5: Start the second set of bicep curls. It is ideal if muscular failure comes before 20 repetitions. Step 6: Set the dumbbells down and rest for approximately 15 seconds. Step 7: Start the third set of bicep curls. It is ideal if muscular failure comes before 10 repetitions. Step 8: Set the dumbbells down and rest for approximately 15 seconds. Step 9: Start the fourth and last set of bicep curls. Muscular failure should come quickly after only a few repetitions. The discomfort should be quite significant. Step 10: Return to the hand grips and do one more set of hand clenches until muscular failure. The discomfort should be extreme. Step 1: Properly set the deflated KAATSU Air Bands around the upper legs. Step 2: Do 2 KAATSU Cycles as a warm-up, inflated with a appropriate Base SKU (Standard KAATSU Unit) pressure and an Optimal SKU pressure. Step 3: Select an appropriate weight load with the pneumatic KAATSU Bands inflated at the appropriate Base SKU and an Optimal SKU. Step 4: Do squats until muscle failure in set #1, ideally between 30-40 repetitions. Rest no more than 30 seconds [see Note below]. 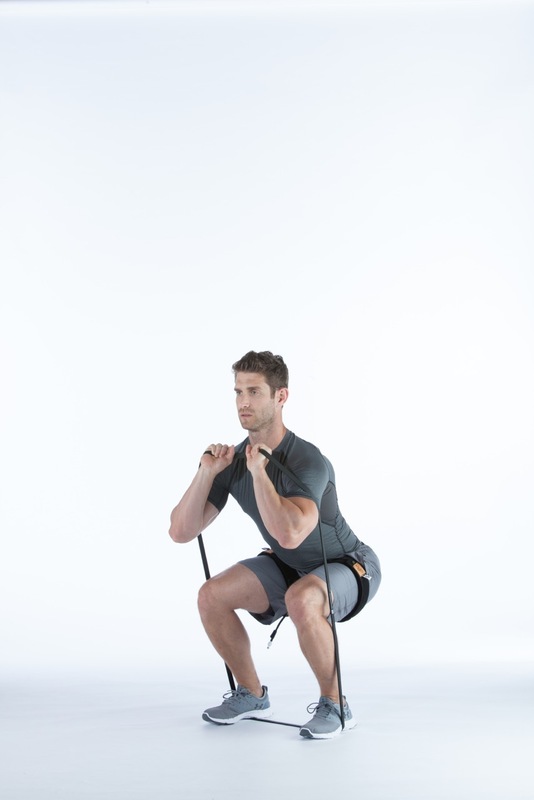 Step 5: Do squats until muscle failure in set #2, ideally between 20-30 repetitions. Rest no more than 30 seconds. Step 6: Do squats until muscle failure in set #3, ideally around 10 repetitions. Rest no more than 30 seconds. Step 7: Do squats until muscle failure in set #4, 1-3 repetitions is sufficient. 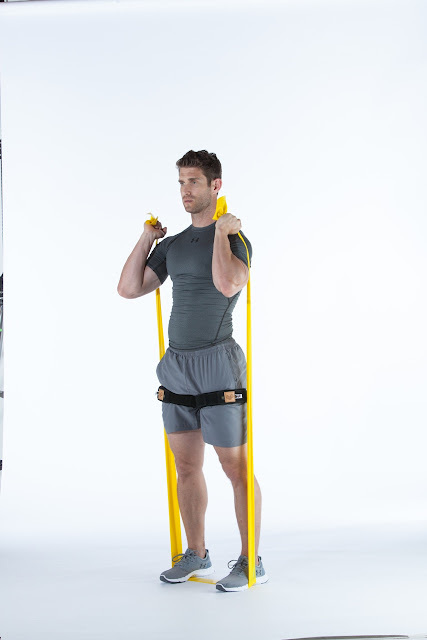 Rest no more than 60 seconds, but do not release air from the pneumatic KAATSU bands around upper legs. Step 8: Do leg extensions until muscle failure in set #1, ideally between 30-40 repetitions. Rest no more than 30 seconds. Step 9: Do leg extensions until muscle failure in set #2, ideally between 20-30 repetitions. Rest no more than 30 seconds. Step 10: Do leg extensions until muscle failure in set #3, ideally around 10 repetitions. Rest no more than 30 seconds. Step 11: Do leg extensions until muscle failure in set #4, 1-3 repetitions is sufficient. 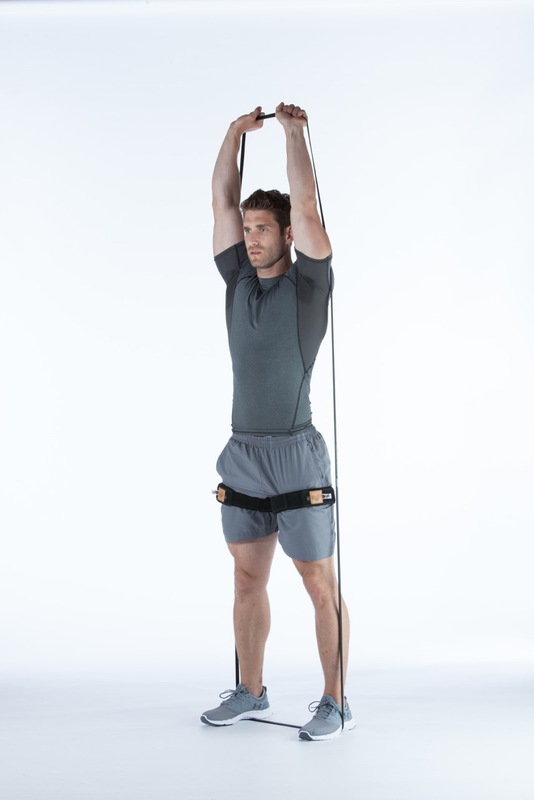 Rest no more than 60 seconds, but do not release air from the pneumatic KAATSU bands around upper legs. Step 12: Do leg curls until muscle failure in set #1, ideally between 30-40 repetitions. Rest no more than 30 seconds. Step 13: Do leg curls until muscle failure in set #2, ideally between 20-30 repetitions. Rest no more than 30 seconds. Step 14: Do leg curls until muscle failure in set #3, ideally around 10 repetitions. Rest no more than 30 seconds. Step 15: Do leg curls until muscle failure in set #4, 1-3 repetitions is sufficient. Rest no more than 60 seconds, but do not release air from the pneumatic KAATSU bands around upper legs. Step 16: Do calf raises until muscle failure in set #1, ideally between 30-40 repetitions. Rest no more than 30 seconds. Step 17: Do calf raises until muscle failure in set #2, ideally between 20-30 repetitions. Rest no more than 30 seconds. 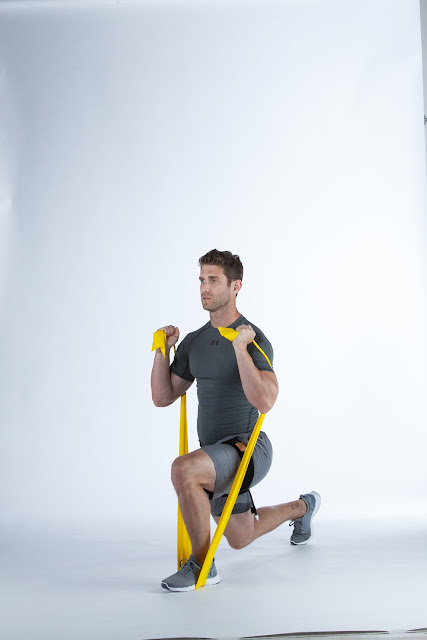 Step 18: Do calf raises until muscle failure in set #3, ideally around 10 repetitions. Rest no more than 30 seconds. Step 19: Do calf raises until muscle failure in set #4, 1-3 repetitions is sufficient. 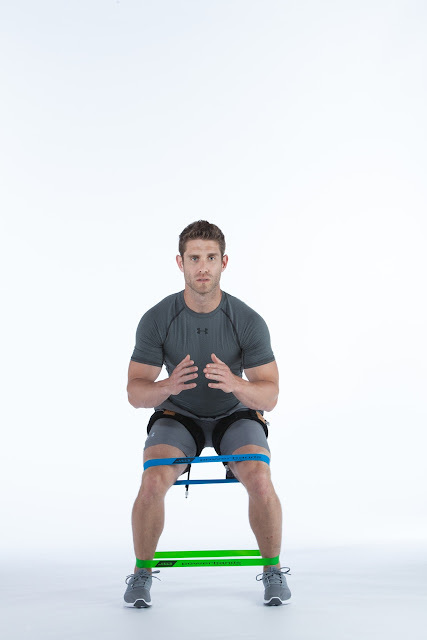 Rest no more than 60 seconds, but do not release air from the pneumatic KAATSU bands around upper legs. * You will feel very pumped up after each KAATSU session. * You may feel post-workout fatigue if the sessions are extraordinarily intense. Note: the recommended rest of 30 seconds for muscle hypertrophy differs slightly than the standard recommendations of a 20-second maximum rest for other KAATSU protocols. KAATSU Specialists often ask older patients or rehabilitating clients to simply stretch as the KAATSU Air Bands are inflated during the KAATSU Cycle mode - and to relax during the 5-second rest (deflated) intervals. These patients do not - or cannot due to age or other ailments - even do the KAATSU 3-point exercises because it is too stressful. For these individuals, stretching with the KAATSU Cycle is sufficiently effective. Conversely, younger healthy KAATSU users can inflate to their Optimal SKU and stretch before and/or after their KAATSU workouts. Stretching with the inflated bands serves to help keep the muscles limber and avoid muscle hypertrophy that some individuals and endurance athletes do not want. 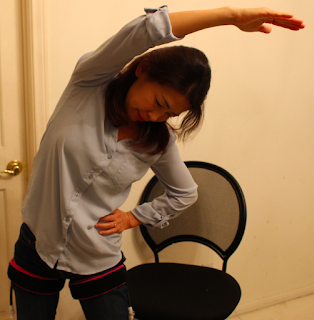 Unlike KAATSU training for muscle hypertrophy (see here), KAATSU users who are stretching do not need to go to fatigue. Most do not even come close to muscle failure. They are simply stretching the muscles that are engorged in blood. Alan Mikesky, Ph.D., FACSM, Professor Emeritus, Department of Kinesiology, School of Physical Education and Tourism Management at Indiana University-Purdue University Indianapolis discussed his experience with KAATSU. "I was first introduced to the concept of KAATSU Training, also known as blood flow restriction training, at the national convention of the American College of Sports Medicine in 2006. KAATSU Training has been and continues to be one of the most exciting innovations involving resistance training that I have run across in my professional career of over 30 years. It has become a very active research area and rarely does a month go by that one or two new studies have not been published in reputable professional journals. The cumulative results from these studies indicate that KAATSU training is safe, effective and deserving of all the research attention it is getting. 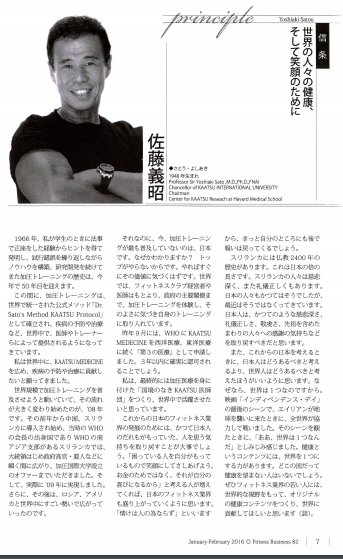 There is still much to be learned about the physiology of how it works, how it is prescribed and its potential applications, but it is clear that KAATSU training has unlimited potential as a means for maintaining and improving muscle function in populations ranging from the infirmed patient to the elite athlete." Fujita, S., A. Mikesky, Y. Sato, and T. Abe. (2008) Fatigue characteristics during maximal concentric leg extension exercise with blood flow restriction. International Journal of KAATSU Training Research. 3: 27-31. Weatherholt, A., M. Beekley, S. Greer, M. Urtel, and A. Mikesky. (2013) Modified KAATSU Training: Adaptations and Subject Perceptions. Medicine and Science in Sports and Exercise. 45(5):952-961. Mikesky, A.E. (2013) Cross-Over Muscular Adaptation to Blood Flow Restricted Exercise. Letter. Medicine and Science in Sports and Exercise. 45(5):1019. Segal, N.A., M. Davis, R.B. Wallace, and A. Mikesky. 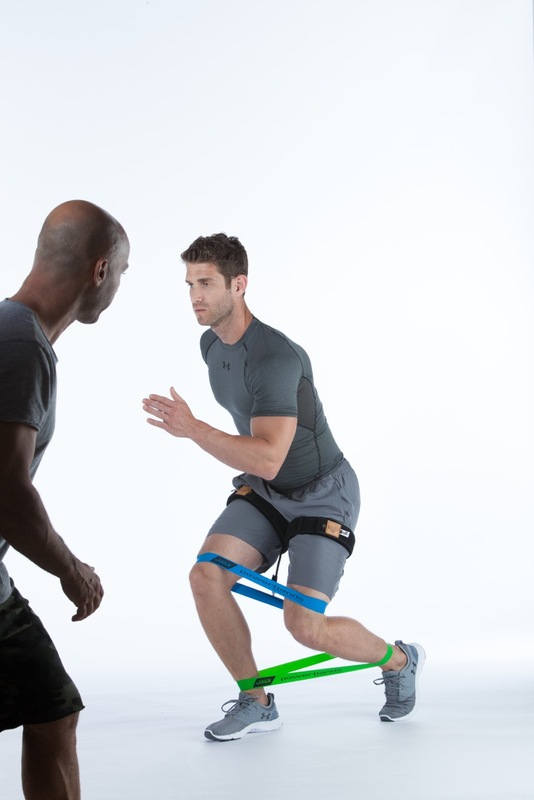 (2015) Efficacy of Blood Flow Restricted Low Load Resistance Training for Quadriceps Strengthening in Men at Risk for Symptomatic Knee Osteoarthritis. Geriatric Orthopaedic Surgery and Rehabilitation. 6(3):160-167. Segal, N.A., G.N. Williams, M.C. Davis, R.B. Wallace, and A.E Mikesky. (2015) Efficacy of Blood Flow-Restricted, Low-Load Resistance Training in Women with Risk Factors for Symptomatic Knee Osteoarthritis. Physical Medicine and Rehabilitation. 7:376-384. Ogasawara, R., M. Sugaya, M. Sakamaki, S. Fujita, H. Ozaki, T. Yasuda, Y. Sato, A.E. Mikesky, A. Takashi. (2009). Change in Temperature of Active Muscle During Low-Intensity Resistance Exercise with Blood Flow Restriction. Med. Sci. Sports and Exerc. (Suppl) 41(5):Abstract #2835, S475. Meek, A., A. Heavrin, N.A. Segal, A.E. Mikesky. (2014). KAATSU Cuff Tightness and Limb Anthropometry: Effect on Blood Flow Restriction. Med. Sci. Sports and Exerc. 46(5S):Abstract #3006. Segal, N.A., A.E. Mikesky. 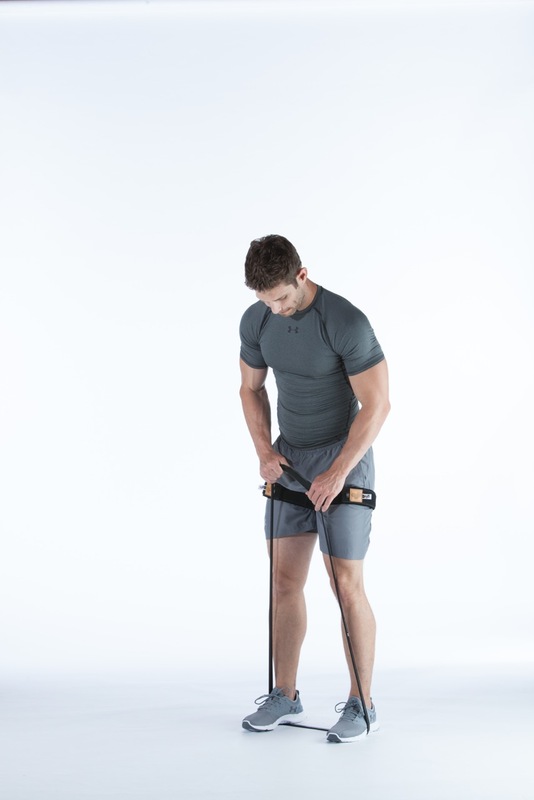 (2014) Assessment of Efficacy of Partial Blood Flow Restriction Low-Load Resistance Training for Quadriceps Strengthening in Men at Risk for Knee Osteoarthritis. Med. Sci. Sports and Exerc. 46(5S):Abstract #3322. The Greatest Olympian of All Time, Michael Phelps, has drawn a lot of attention to the ancient Chinese art of cupping during his continued gold-medal run at the 2016 Rio Olympic Games. Phelps, along with other American Olympians like 12-time medalist Natalie Coughlin and actresses like Jennifer Aniston, Gwyneth Paltrow and Jessica Simpson, have been seen with several visible red round marks on their body. Cupping is used for recovery and to relieve pain. It is also used to treat pain, shingles, acne and breathing difficulties. Practitioners of cupping use small glass cups that are placed over the skin and then a vacuum is induced inside a cup. The suction pulls the skin up into the cup that breaks the capillaries and causes the blood to pool and stagnate. This creates a bruise and leaves circular spots on the skin. Cupping is commonly used among athletes because they want to stimulate blood flow in order to help muscles heal more effectively and quickly. But physicians and physiologists know that a bruise is a blood clot. But does clotted blood really lead to improved blood flow? Improved blood flow or not may not matter to Olympic athletes if the placebo effects of cupping provide them with a psychological advantage. This positive mindset may be significant enough to provide them a 0.04 second boost – or the difference between Phelps’ gold medal performance in the 200-meter butterfly and the time of Masato Sakai of Japan, the silver medalist. But there is an alternative to cupping, a scientifically proven, effective, and safe way to improve blood flow and enhance recovery from strenuous exercise, either in competition or in training. KAATSU, or generically described a blood flow moderation exercise, was invented in Japan in 1966 by Dr. Yoshiaki Sato. After three decades of meticulous testing with people ranging from 4 to 104 years and years of research, athletes in 19 countries have discovered what is explained in over 100 peer-review published papers. KAATSU is now used by athletes and teams in the NFL, NBA, NHL and Major League Baseball as well as Olympic swimmers, runners, triathletes, judoka, rowers, wrestlers, basketball players and rugby players from the United States, Japan, Brazil and China, as well as countries ranging from Hungary to Tunisia. It is also used by NASA, American colleges from West Point to the University of Missouri, and in hospitals and clinics from the University of Tokyo Hospital to the Albert Einstein Hospital in São Paolo. KAATSU equipment consists of a portable handheld unit that carefully monitors the external compression of pneumatic bands placed on the upper arms and upper legs. These pneumatic KAATSU bands serve to safely reduce venous flow in the limbs, thus leading to an effective pooling of blood in the arms and legs. Through stretching or any form of movement – either strenuous exercise or physical therapy – with the KAATSU Air Bands on, the pooling of blood helps expand the veins and capillaries. Additionally, the KAATSU Cycle function effectively flushes out lactic acid in the muscles. After 5-10 minutes of KAATSU Cycle, the athletes feel rejuvenated because the lactic acid is not only effectively removed from the muscles, but also the expansion of the vascular walls leads to an increased elasticity of the veins and capillaries. There is also a concurrent release of growth hormones and nitric oxide caused by this blood pooling that aids recovery. This biochemical reaction is a natural effect of blood pooling that has positive systemic effects on the body. 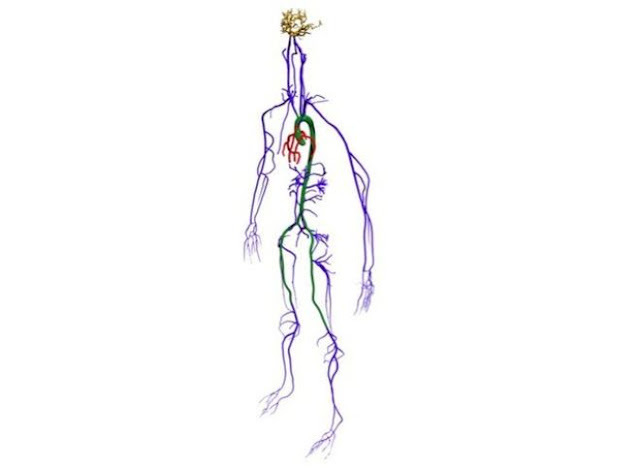 The hormones are transported throughout the body via the vascular system. When these hormones reach muscle cells that are under stress, cell receptors in these cells interact as the body is designed to do. Therefore, KAATSU is a scientifically proven modality that has natural systemic effects on the body. These are not only more healthful and effective than localized cupping, but it also leads to a natural hormonal release and improved elasticity of the vascular system. *Cupping breaks the capillaries in a localized area. KAATSU improves the elasticity of the capillaries. *Cupping creates bruising in a localized area. KAATSU leads to a natural hormonal response. *Cupping leads to visible red spots on the body. KAATSU leaves no visible marks on the body. *Cupping requires an experienced practitioner. KAATSU can be done anywhere anytime by anyone who follows the standardized KAATSU protocols. *Cupping feels very good to many people after a session. KAATSU makes the body feel recovered and very good after a session. Swimming World Magazine also wrote about cupping by Olympic swimmers here. For more information about KAATSU, visit @kaatsuswim, @kaatsuglobal, Facebook, Instagram and KAATSU Global. Samuel Amorim, the first KAATSU Specialist of KAATSU Brasil, is doing a wonderful job in Brazil, especially among older patients doing KAATSU Cycle and KAATSU Training. Amorim initially warms up his clients and patients with the KAATSU Cycle while they are sitting and stretching. Then, they do a variety of exercises following the standard KAATSU protocols with resistance bands. Additional KAATSU Brasil activities are posted on both Facebook and Instagram. 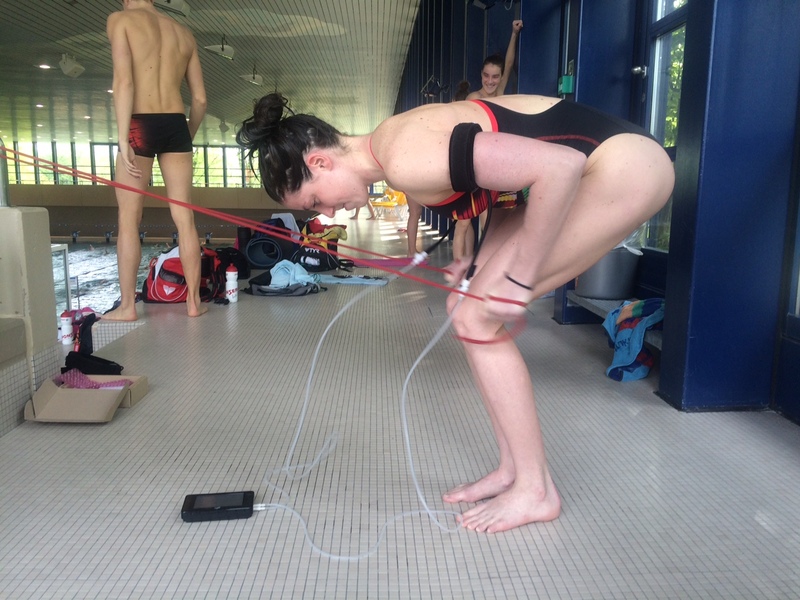 Danish national team swimmer Emilie Larsen and her trainer explain how she recovered quickly from an ACL injury with KAATSU. It is always a pleasure to work with athletically-minded individuals who cannot stand atrophying as they rehabilitate from injuries. Jack [shown above] is one of those hard-charging athletes. A highly competitive motorcycle racer, Jack has broken dozens of bones throughout his career and has undergone his fair share of surgeries. Then he discovered KAATSU with Dr Arthur Ting of Fremont, California. Below is a typical daily rehabilitation/training program for Jack: He comes into the KAATSU Studio well-hydrated and first works on his arms with the KAATSU Nano device and a medium set of KAATSU Air Bands. Then, he works on his legs. He takes the time to accurately set his correct Base SKU and then identify his Optimal SKU using the standard KAATSU protocols. He understands well the subtle importance of safely and effectively compressing the venous flow in order to stimulate a systemic response from KAATSU. He also throws in an occasional walk with the KAATSU leg bands and does bouts of stretching while doing the KAATSU Cycle. KAATSU Specialists Robert Heiduk and Marek Joschko from KAATSU Germany wisely use soft KAATSU Balls with the KAATSU Cycle modality. The soft KAATSU Balls helps clients, patients and athletes do hand clenches at the correct speed (i.e., slowly) during the KAATSU 3-point exercises. KAATSU users should do hand clenches, biceps curls and triceps extension slowly and steadily during the KAATSU 3-point exercises. 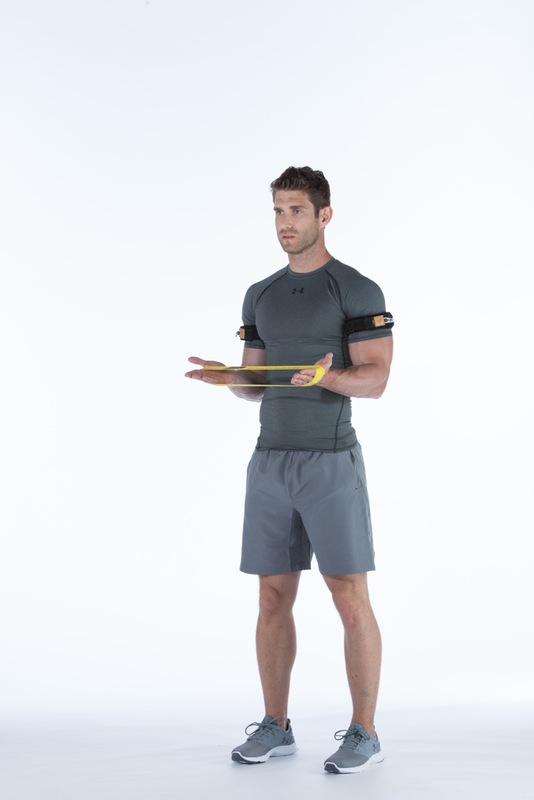 Uno Gomes, Founder and CEO of Let's Band in Malta, shows how to use resistance bands with KAATSU for a great upper body workout. Standard KAATSU protocols calls for the athlete to do 3-4 sets of each exercise. There should be between 15-20 seconds of rest between each set. If the appropriate Base SKU and Optimal SKU is set, the athlete will reach failure at a decreasing number of repetitions on each subsequent set (e.g., 25 reps on the first set, 15 reps on the second set, 5-10 reps on the third set). Failure to move the limbs - either muscular or technical - is important in order to send a failure signal through the central nervous system to the brain. This will elicit a cascade of positive physiological reactions in the body. Uno Gomes, Founder and CEO of Let's Band in Malta, shows how to use resistance bands with KAATSU for a great lower body workout. A new supercomputer simulation of blood moving around the entire human body compares extremely well with real-world flow measurements, researchers say. Read more here on BBC. The 22-year-old powerlifter from Germany set a new national junior deadlift record in November 2015. The 94 kg powerlifter hoisted 307.5 kg. Five months later in March 2016, Mavrici increased his deadlift performance to 320 kg while shedding 2 kg of body weight. His improvement was credited to his use of KAATSU training. But his improvement was not limited to his deadlift. 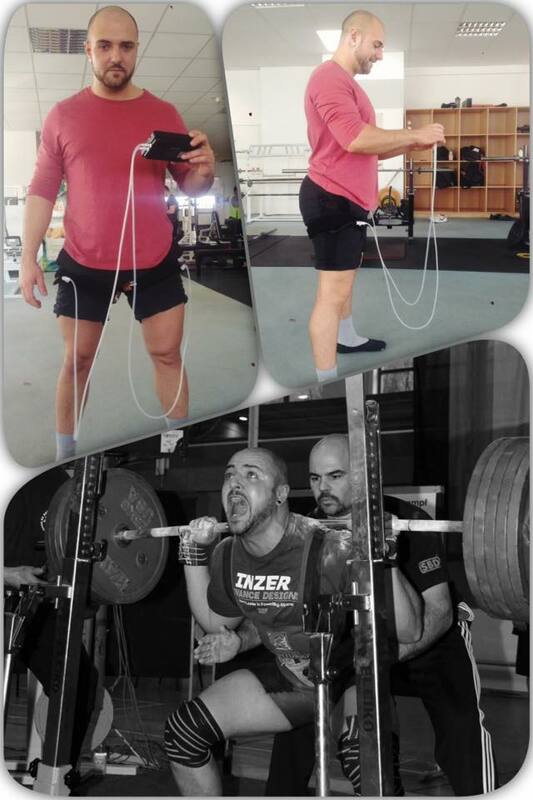 During the same period, he also improved his squat best from 275 kg to 300 kg. Mavrici uses a KAATSU Nano to recover from his strenuous competitions. "After a deloading period with KAATSU Training, he comes back more refreshed and stronger because KAATSU does not create muscle damage," explained Robert Heiduk. "KAATSU leads to high levels of muscle activation. It’s very good at inducing hypertrophy with potential in many different settings ranging from rehabilitation and regular exercise to sport specific training." 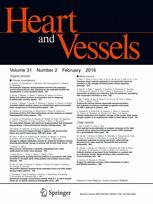 The January 2016 issue of Heart and Vessel Journal, published by Springer, includes an article by Japanese researchers Toshiaki Nakajima, Tomohiro Yasuda, Seiichiro Koide, Tatsuya Yamasoba, Syotaro Obi, Shigeru Toyoda, Yoshiaki Sato, Teruo Inoue, and Yutaka Kano that is entitled Repetitive restriction of muscle blood flow enhances mTOR signaling pathways in a rat model. The final publication of this article is available here at link.springer.com (ISSN 0910-8327, Heart and Vessels, DOI 10.1007/s00380-016-0801.6). The researchers are from the Dokkyo Medical University and Heart Center, Seirei Christopher University, University of Electro-Communications, and University of Tokyo in Japan, and KAATSU International University in Sri Lanka. 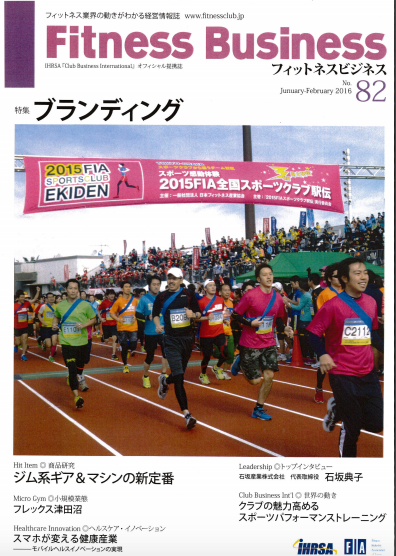 In the January-February 2016 issue of the Japanese-language Fitness Business Magazine, KAATSU inventor Dr. Yoshiaki Sato explained his founding principles for KAATSU. His principles serve the foundation for the KAATSU concept and the underlying goals of KAATSU Global, Inc. and KAATSU International University in Colombo, Sri Lanka. The article in Japanese reads, "My principles were established to improve the health and elicit smiles of people around the world. This year marks the 50th anniversary of the invention of KAATSU Training, which I was inspired to invent when I was a student sitting on my knees at a Buddhist ceremony in 1966. I went on to build my know-how through trial and error and ongoing research and development. During this period, KAATSU Training's official, globally-consistent method, known as 'Dr. Sato’s KAATSU Protocol', was established so that physicians and trainers around the world could offer the training to prevent and treat ailments. It is my hope to share KAATSU Medicine around the world to help prevent and treat ailments. A turning point came in 2008. The year before, China and Sri Lanka began adopting KAATSU Training. 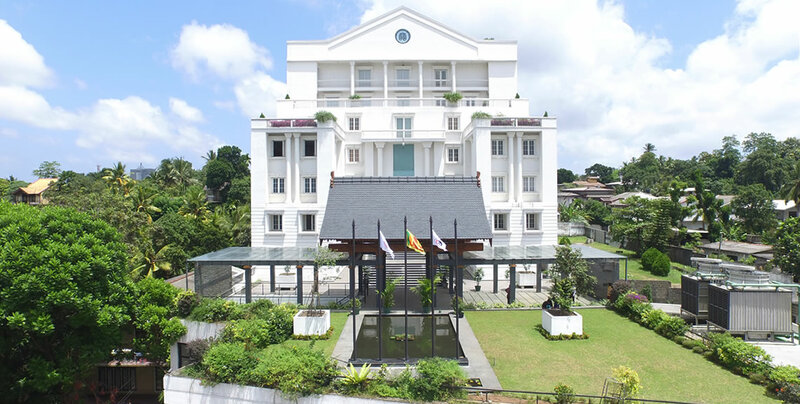 In Sri Lanka, where the then-Chairman of the World Health Organization (WHO) hailed from and where the South Asia regional office of WHO was located, KAATSU spread like wildfire. It started with Sri Lanka’s president, its high-ranking government officials, and other key individuals in the country. This adoption eventually led to an offer from Sri Lanka to establish KAATSU International University there. The University was established in 2009 [see below]. After that, there was no stopping as KAATSU Training as it spread globally to Russia, to the United States and to other countries. Yet, there is one country where the spread of KAATSU Training is lagging behind the others: Japan. Can you guess why? It’s because the Powers That Be do not practice it. Once they do, they will be aware of its value. In the rest of the world, not only fitness-club owners and physicians, but also key government officials have personally experienced KAATSU Training, becoming aware of its benefits and incorporating it in their own personal training regimens. Last September, we applied to the WHO for KAATSU to become the "Third Medicine" after Western Medicine and Eastern Medicine. It is certain to be approved within three years. What I ultimately want to do with those trained in KAATSU Medicine is to create “KAATSU Doctors Without Borders" and send them off to the world to help those in need. If we wanted to see Japan’s fitness industry grow, we will need to regain what we Japanese had in the past: our compassion for others. If more people said, “Let’s use what we have to bring smiles to the faces of others in need. Not to do it for the money, but for the joy it brings to us,” I believe the fitness industry in Japan will begin to thrive. As the Japanese saying goes, “Compassion is not for the benefit of others." I'm sure that someday the reward will come back to us. Sri Lanka has 2,400 years of Buddhist history. That is twice as long as that in Japan. People in Sri Lanka are compassionate and courteous. So were the people in Japan, but not so much today. I believe that the Japanese people must get back to their roots of being compassionate, courteous, pious, and thankful of others and our ancestors. But when we think of Japan in the future, rather than thinking of how the Japanese should be, we should think of how the Global Citizen should be. After all, it’s because we are all one world. In the movie Independence Day, when the aliens came to attack our earth in the end, the whole world united to fight them. When I saw that scene, the realization that we are all but one world came over me. The content of health has the power to make the world one. There is no country in the world where people do not wish for good health. My hope for the young in the fitness industry is to have a world vision in creating original contents for health in order to help make the world a better place." Professor Sir Yoshiaki Sato, M.D., Ph.D., FNAI was born in 1948 and currently serves as the Chancellor of KAATSU International University in Sri Lanka [see below] and the Chairman of the Center for KAATSU Research at Harvard Medical School. KAATSU Specialist Robert Heiduk explains the mechanism and equipment of KAATSU using the KAATSU Master and KAATSU Air Bands in the German language. KAATSU Specialist Robert Heiduk from the University in Bonn presents KAATSU training and equipment (KAATSU Master, KAATSU Nano and KAATSU Air Bands) in German. Carl Lanore of Super Human Radio interviewed Dr. James Stray-Gundersen about KAATSU on October 12th 2015. ...it's Super Human Radio with your host, Carl Lanore. Carl Lanore: Hey, hey welcome back to another episode of Super Human Radio. We have a great show planned for you today. We're going to be covering quite a few really important subjects. 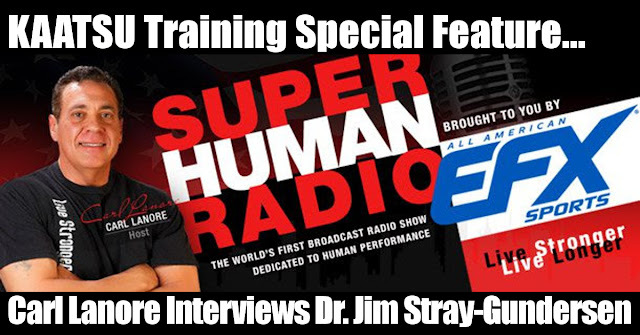 We're going to be joined by Dr. Jim Stray-Gundersen to talk about KAATSU training. There's a lot of discussion about KAATSU, a lot of misinformation out there. There isn't a single person on the planet that knows more about it, even above and beyond the Japanese scientist that discovered it than Dr. Jim Stray-Gundersen, so we'll have some good questions and answers for him. We started talking about KAATSU training in early 2006 I did my first discussion with a Japanese scientist and ever since then it has really intrigued me and everybody else out there. We're going to get to the bottom of KAATSU training today with Dr. James Stray-Gundersen. How you doing Dr. Gundersen? Dr. Stray-Gundersen: Very good, thanks Carl. Carl Lanore: Let me just give a brief highlight of your CV here because it's very impressive. Carl Lanore: Well you're a general surgeon, which qualifies by the way to run for president now. 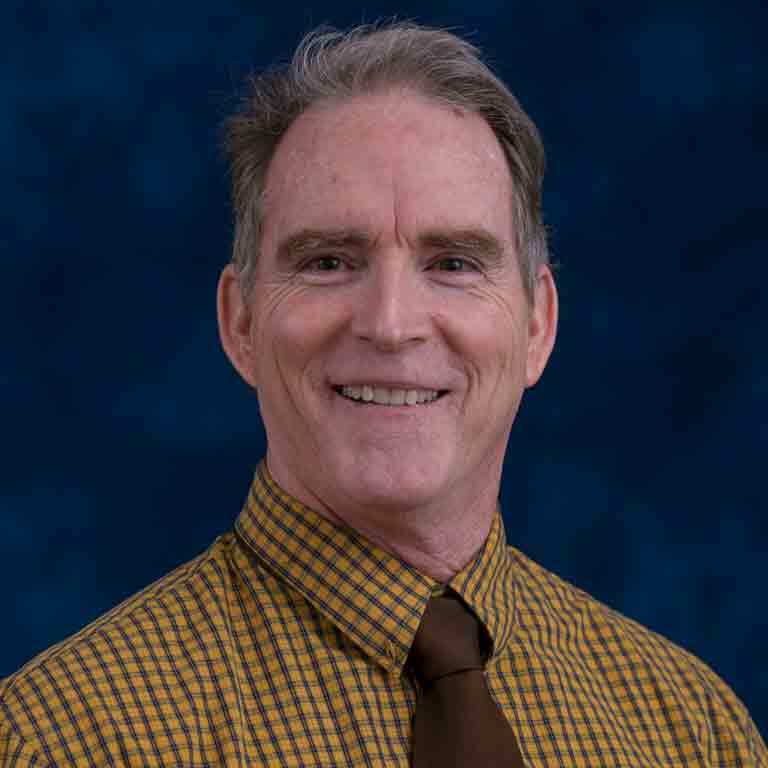 Carl Lanore: University of Southwestern Medical School, Associate Professor in Exercise Science and Human Performance for the past 18 years; four Olympic games as physician or physiologist; twenty world championships at various sports physician, physiologist; altitude expert. We were just talking about the role of hypoxia and remodeling of fat cells in leptin sensitivity. World renowned anti-doping expert and involved in many sports to advance performance legally and ethically, NFL, ABA, FIFA, I mean your list goes on-and-on. Why did you look at – what made you interested in KAATSU training first of all? Dr. Stray-Gundersen: Well it kind of goes back aways. As you pointed out my initial education was as a general surgeon, but after I finished my general surgery residency I ended up doing some post-doctorate fellowships in cardiovascular physiology and another one in human nutrition. I kind of or I did fall in love with the idea of using the medicines of exercise and nutrition to promote health and fitness. And that wasn't really aligned with taking out gallbladders. So I ended up having a career as you pointed out in academic medicine and doing various research projects. But the key thing to all of these things is looking forward to how to optimize human health and fitness. About four years ago I got introduced to KAATSU. It just struck me as one of those things that is a real paradigm shifter in terms of how we can safely and effectively improve health and fitness in humans. Carl Lanore: So KAATSU was first written about in a paper from some Japanese scientists who were looking at KAATSU. Correct me if I'm wrong because it's been awhile, but they were looking at KAATSU not necessarily for performance, but as a therapeutic aid to recovering from an injury and avoiding the muscle loss generally seen from an injured limb, right? Dr. Stray-Gundersen: Right. Right here is the essence of KAATSU. So basically what we do is with very light weights that can be done by anybody whether they have an injury or not, we end up being able to do maximal strength training exercise. So that exercise then mitigates any atrophy that might be happening, but it also sets up a kind of hormonal situation where you end up adapting to the exercises that you've done, but you've tricked the brain. Normally to get this kind of hormonal release you have to be lifting really heavy loads and exhausting yourself and with KAATSU you can do it with very light loads and in a short period of time. So it ends up being a very efficient way of doing this. Then there's applications for whether it's seniors who can't lift very heavy weights in the first place or someone who's injured, say someone who's torn their ACL and they're coming back from an ACL tear, but this is a way to exercise their quads to get that muscle mass back. Carl Lanore: So and you know I've often thought what I'm about to say but I've never said it on the show, there's always this discussion about what builds bigger muscles? Carl Lanore: And there's the group out there that says you know heavier loads and the group that says higher reps and the reality is that it can be either if you stimulate a phenomenon which I can only use the word "muscular congestion." Depending on when you were able – where in that dynamic of exercise that your performing whether it's heavy weight or higher reps, you know lower reps with heavy weights or higher reps with lighter weight, if the muscles getting congested that is where it appears that the intramuscular growth factors and switches that seem to be exploited by KAATSU really say, "Look this is what builds muscle. It doesn’t matter if you're using heavy weight with low reps, it doesn't matter if you're using light weight with high reps, what matters is that this condition is occurring in the muscle." Am I off base on that? Dr. Stray-Gundersen: No. I would just kind of phrase it a little differently. I would say that what KAATSU does is it impedes the blood flow out of the muscle such that the muscle when it's exercising it can't get its normal recovery that blood flow allows. And because it can't recover a profound disturbance of homeostasis is induced in this muscle. This disturbance of homeostasis and I know that's a little bit of a mouthful, but this disturbance of homeostasis is when for example the oxygen levels in the muscles go down or the pH does down, which means that the environment is becoming more acidic or various electrolyte gradients are coming out of spec if you will and there is a variety of these things that happen when a muscle is exercising and it can't get recovered. This contraction becomes unsustainable and then that unsustainable contraction sends a signal up into the brain saying, "Holy mackerel guys you got to help me out here." We're aware of that feeling cortically by a hard effort or a feelings of fatigue or feelings of congestion and a variety of these things such that we end up sending the brain this signal. It's usually only in both cases like you know 20-miles out on a long run or by lifting 300-pounds squats and doing that kind of thing where you'd get to these situations where the disturbance of the homeostasis in the muscle has been so profound that these kind of messages to the brain are screaming out for help. Then the brain responds by an outpouring of a hormonal milieu that maybe milieu that may be best illustrated by increases in growth hormone or profound increases in growth hormone from this exercise. Then that healing anabolic hormonal response out of the brain is then responsible for all this rebuilding process and healing process and then we go from there. Under normal circumstances whether it's with the marathon or whether it's Olympic weightlifting that muscle has been damaged by this stuff. But in the case of KAATSU we haven't damaged the muscle, we've just fooled the brain into thinking all hell was breaking lose. Dr. Stray-Gundersen: Okay? And so then you adapt – instead of having to dig yourself out of this hole you just can start increasing strength and fitness right off the bat. Carl Lanore: Oh man okay so two things that jump out of me big time here that I did not understand and this is really great stuff. You're right because we talk about the net synthetic response of exercise in building muscle and we know that if damage is negative 10 and growth is positive 12, you have a net influence of 2 on the growth of muscle. What you're saying is damage is zero, so whatever the growth impetus is that is a positive X whatever that is. Carl Lanore: So you're really building on a foundation of already ready to grow muscle as opposed to previously damaged muscle. Dr. Stray-Gundersen: Exactly. So we've altered the balance. We've really decreased those negative stimuli to a minimum and we've maximized because this is a maximal signal, we've maximized adaption healing response. And so you know you just tilted the teeter-totter and all of a sudden you know off you go getting stronger and fitter right off the bat and you've done it with really low weights. Dr. Stray-Gundersen: So anybody can do it. Carl Lanore: Okay now wait a minute because we're going to get into the weight loads in a second. Now the other misunderstanding I've been under is that the increase in growth factors, mechano growth factor which I think is IGFE or 1E or something like that, all these things happen in the muscle exclusively than systemically. Am I incorrect? Is it just being what's the word I'm looking for, trapped and concentrated in the muscle, but it's actually produced systemically? Dr. Stray-Gundersen: Well there's a couple of things, there's both local effects and systemic effects. Dr. Stray-Gundersen: So imagine we have a muscle exercising and its blood flow is not a happy camper, it can't recover the muscle as well as it would like too. So then there are various sort of near-term hormones that are in the tissue itself or in the surrounding tissue that end up sending signals that do a variety of things. Like they essentially try to repair this damage that's being done. There's various cytokines that are locally released that do things like turn on protein metabolism, they prepare cell-surface receptors such that they will be responsive to any systemic hormones that are coming along. Those sorts of things are all done at a local level. Then because this signal of this disturbance of homeostasis has been sent up into the brain it has caused among other things the pituitary to release a lot of growth hormone. This growth hormone then goes among other places to the liver where it stimulates the production of IGF-1. Then IGF-1 then goes out throughout the whole the whole circulation. It then where there are cell receptors that have been up-regulated or turned-on such that they will be receptive to these anabolic stimuli, then those tissues that have been exercised end up further amplifying their production of proteins and trying to repair what damage was done. The nice little thing about this is that the damage wasn't done, we just fooled the brain into thinking it was. Carl Lanore: This is brilliant. Then obviously the brain gets – the body gets to work in super compensating and preparing for the possibility of another one of these muscular onslaughts and it increases the muscle size and we're going to talk about obviously it influences hypertrophy, but we're going to talk about strength in a second. Carl Lanore: You know everybody talked about work smarter not harder. Lee Haney used to say, "Stimulate, don't annihilate." Dr. Stray-Gundersen: There you go. Carl Lanore: It sounds to me like KAATSU is the gold standard for those who want to work smarter not harder. But let's talk about two things when we come out of the break. Let's talk about the load, because what I see people doing with KAATSU is instead of using a light weight they use heavier and heavier weights and try to bridge the strength and muscle hypertrophy gap. Carl Lanore: But also I want to talk about what KAATSU is not good for, if there is anything and then we will talk more about training styles. In the meantime if you're anxious to get information you can go to the website KAATSU-global.com. I'm going to spell it for you, it's: K-A-A-T-S-U hyphen or dash depending on what part of the country you're from, global.com. They're giving away a free four megabyte report on lots of the things that we're talking about here. You need to go there and get that. We talk about advanced training techniques like statics and negatives. There may not be anything more advanced than KAATSU, but you have to understand how to use it, because like all things that really work it can backfire on you too and we'll talk about that in the show too. We're talking about KAATSU training right now with Dr. James Stray-Gundersen. I have to thank a listener from Budapest, Hungary for putting this show together today and that's Peter Lakatos. A lot of the things that we're talking about here today if you want to get a little deeper into it you can go to the website, KAATSU-global: K-A-A-T-S-U hyphen G-L-O-B-A-L.com and download their report and obviously communicate with them there if you want to try to adapt this to your own training. So first things first the weights that people use must it be light weight or is there an advantage to doing some sort of progressive loading when you're doing KAATSU? Dr. Stray-Gundersen: Yeah Carl this is really an important point. We're paradigm shifting here. We're thinking about using impeded blood flow or modified blood flow plus low weights, light weights, easy weights to send this signal to the brain. So we're using the muscles that are you know normally when we think about training we think about we're training the muscles that we're exercising. This is we're using the muscles that are being exercised in contute to send this signal that causes the whole body to adapt. Carl Lanore: Yeah I was just going to say that. It sounds to me like if you want to do KAATSU look a lot of us going to the gym with our training buddy, his name is Ego and the last thing we want to do is grab a pair of two-pound dumbbells and have 19-inch arms and people go, "What's that about?" You know when I was a kid there were guys in the neighborhood that would buy a Camaro, put a Phase 3 hood on it, put Mickey Thompson 50-Series tires on the back, put you know traction bars on it and they had a four cylinder or a six cylinder and we used to call that a "pig." Carl Lanore: So you know a lot of us guys we have an ego, we're going to go in and lift heavy. It sounds to me that KAATSU would best suited for bodyweight training. Dr. Stray-Gundersen: Yes it is. So you can do all the KAATSU exercises and you can get a really good KAATSU effect without any additional weights or devices or anything. Now that's not to say that we're going to have to throw out all the weight racks we have at home. The idea is that particularly for strength-oriented sports, let's say alpine skiing or Olympic lifting or football or these sorts of things where strength is critical and let's say standard weight training has always been part and parcel of getting fit for those sports. What we do or what we recommend at the U.S. Ski Team where I'm working is that we have the athletes do 90% of their normal weight workout. So to induce a little fatigue but they save the riskier lifts to trying for KAATSU. So we don’t want anybody doing maximal squats or these bench presses where they might drop the weight, where they might hurt their back or that kind of thing, but we do all the other stuff. Then after that workout then they come in and they do a KAATSU session. That really polishes it off, because now the muscles are already fatigued, it's already giving them a little bit of a signal and then we hammer it with this KAATSU program that really takes it over the edge, but does so safely. There's no heavy weights involved. We're able to get people where they just can't do one more pushup. So then what we're doing is we're getting the traditional training plus we're getting what I think of as frosting on the cake by doing that KAATSU session. Carl Lanore: Okay so the traditional training is going to influence neuromuscular adaptation which gives us strength and instead of doing some you know other type of 20-rep scheme thing just do a KAATSU movement at the end to kind of influence hypertrophy. Dr. Stray-Gundersen: Yeah. One of the things to think about is you know in various forms of training whether it's strength training or endurance training or all of these things you know there's not that many times in a week where you can really take it to max. Dr. Stray-Gundersen: And what KAATSU does is again frosting on the cake of all of the other training that's been going on and you just back-off that training just a little bit and you let the KAATSU session end up being those maximal workouts. And because you're not getting the damage that's normally associated with it then for one thing you recover a lot quicker and you're ready to go the next day. You can actually add on more maximal sessions a week than you otherwise could. All this stuff going back to that initial thing you were talking about where we're shifting the balance between the negative effects of training and the positive effects of training. 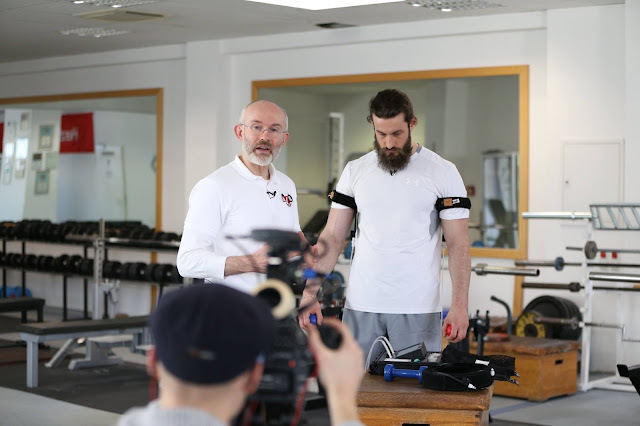 And so what we're doing is we're cutting down on the negative effects, adding onto the positive effects, getting a more robust adaptation and fitter and stronger and faster and everything. Carl Lanore: I want to talk a little bit about the way that you occlude and how critical this is. I know the original studies they were using blood pressure cuffs so they could actually measure in milligrams of mercury just how much pressure was being applied. Today guys go into gym and literally tie ropes around their upper arms that have no give whatsoever and are choking the muscle up. There's a big difference between doing this right and doing this wrong. Can we talk about that when we come back from the break? Dr. Stray-Gundersen: Absolutely. Carl Lanore: We're talking with Dr. James Stray-Gundersen. We're talking about KAATSU training. This is the definitive interview on KAATSU training because there's lot of misinformation out there. Carl Lanore: Yeah there is and it's not one of those things that if you get bad information you just won't grow, you can actually hurt yourself. One of the things that people need to be careful about is the level of occlusion or restriction and there's differences in that terminology in the science. Then what they consider vascular occlusion and vascular restriction are vastly different. One seems to still have some compensatory blood flow in-and-out of the muscle. The other seems to stop it completely. How do people determine how far to go or is that something that you offer at the website? Do you offer the actual cuffs and how to use them? Dr. Stray-Gundersen: Yeah Carl these are great questions. Let me take a moment and kind of describe some of the history here. Dr. Sato really invented KAATSU training in 1966 or that was when he had a little epiphany about how to do this. He then took about 30 years of tying bicycle tires around his arms, judo belts, what have you and kind of learned the hard way and from experience how to do this stuff right. At the same time kind of little bits of these secrets were leaking out of Japan and into primarily the bodybuilding world and a number of other things. While Dr. Sato really didn't explain himself well a lot of these other people saw what he was doing or at least at the time. Then they had big ideas about what they thought he was doing and went and tried a bunch of stuff for themselves. So if you think of this area of blood flow restriction as one big thing around the world and there's our whole variety of things that kind of come into that circle, KAATSU is a subset of that. It's really only safe and only really effective when it's done the way Dr. Sato says. So there's a variety of protocols that are very important in terms of how you get these things done right and done safely. So for example that is the primary reason why we have basically these instruments that allow us to very carefully judge what the right amount of impediment of blood flow is or the right amount of modification. There's another aspect to this. So the way that we use these bands or the stuff that goes around the arms and the legs is that there's an air bladder in there and this air bladder we can very finely change what the pressure is in there. And what we do then is we kind of go through a set of pressures where we then check to see whether we're seeing the right kind of physical signs that we have not occluded, but that we have impeded blood flow such that the exercises that will be done will produce problems or not problems but failure, fatigue, send a signal up into the brain. Dr. Stray-Gundersen: So it's very critical the two big things and this is one of the things that the KAATSU protocols are very good for is that we absolutely don't want to occlude. If we do occlude that's the thing that can lead to severe muscle damage or sometimes blood clots or a variety of other complications. Usually pretty much everywhere where we've seen these kind of complications it's because people are either not even doing KAATSU at all or they're doing it incorrectly. So what is critical is getting the right equipment, getting the right education, and then doing this and applying it in the right way. Carl Lanore: Now there are people out there who are going to try it obviously and they're not going to want to buy things to try it. Dr. Stray-Gundersen: Right. Carl Lanore: Is there kind of a rule of thumb that look if the muscle is occluded and you're going to feel this severe pump, you're going to feel this accumulation of lactate build up rather quickly, is it kind of like something that we say, "Look if you're starting to fail and feel these things in the first couple reps you're too tight. You're shooting for a 10 to 15 rep where you start to experience this." Is there anything that we can give some safe advice on that or is it something that they must follow exactly what you offer at the website? Carl Lanore: I know you're probably reluctant, I know you're reluctant to give that kind of broad scope statement being within the medical but you know. Dr. Stray-Gundersen: No, no I think I can address it to some extent. What I would say is that it's not easy to get to the right level of blood flow modification without using the devices. Dr. Stray-Gundersen: So what happens and believe me Dr. Sato has tried over the years to do this in a way where it's just a matter of throwing on some belts and he's come to the conclusion that you need to have this education and you need to have the equipment to make it work right. Dr. Stray-Gundersen: Now so and most of the time or I should say all of the time when we're figuring out where it is that somebody needs to have these pressures we're taking it a step at a time, we're undershooting in the first place and then we're checking things and then sometimes you have to do sets of exercises to see if you get this fatigue or failure in the proper number of reps. So standard KAATSU exercises end-up being usually three sets of the same exercise and usually we go about 25-to-30 reps in the first set, 20-to-30 second pause, then usually it ends-up producing failure in 20-to-25 reps on the second set, again a 30-second pause and then usually failure comes pretty quick in the 15-to-20 rep range. That's when you know you have it just right. 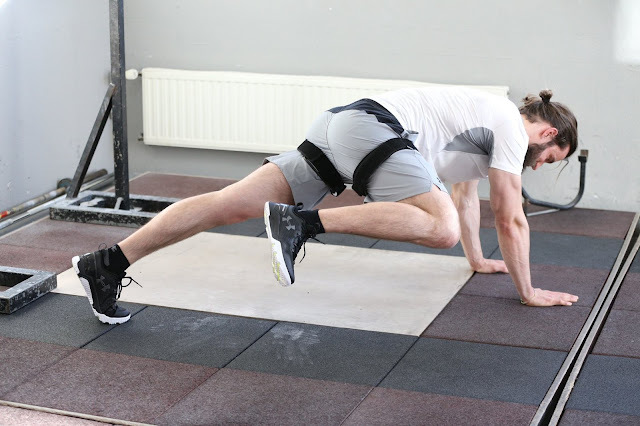 It means that you put the bands on in such a way and the pressures are set in such a way that you get failure in the period of those sets with very light weights or something like pushups or just getting up and out of a chair. Carl Lanore: Okay, okay. Now are there any muscles that are not good candidates because of where they are, because of kinesiology, because of where the blood flow comes from, that are not good candidates for KAATSU? Dr. Stray-Gundersen: Well this is one of the unique things about KAATSU. So one of the things it is a critical step so you know if there is one thing to say never occlude. 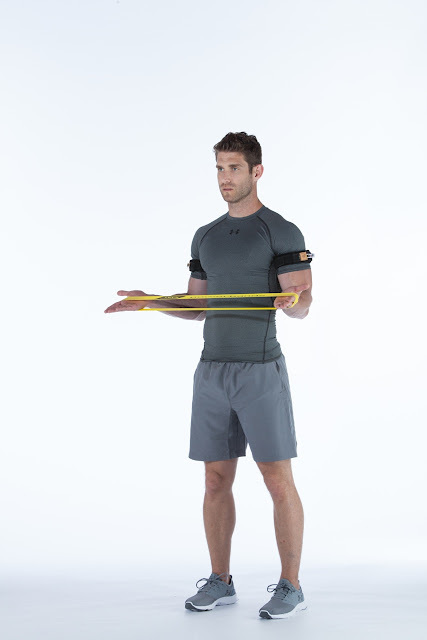 The next thing to say is always put the bands in the correct places, which is kind of just below the deltoid and just above the bicep on the arms and pretty much high up on the legs as far as you can go. 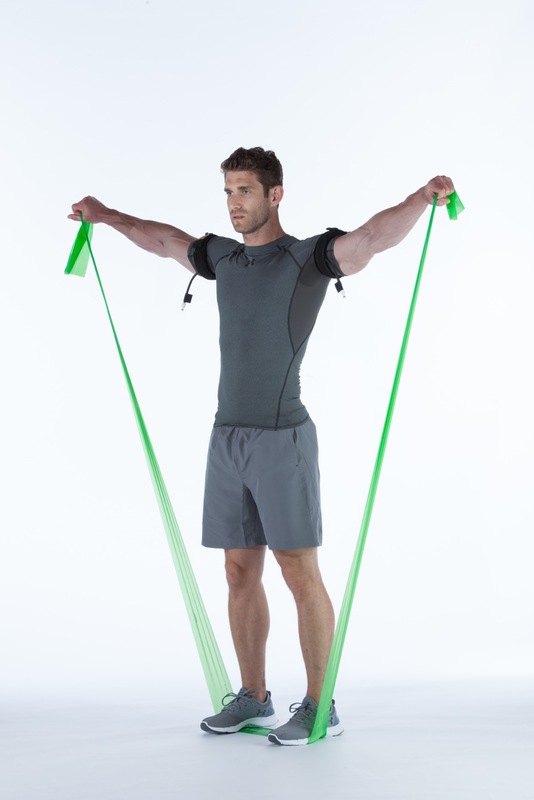 That then produces this impediment of blood flow for all of the muscles that are distal to these bands. So when that happens then were using as many muscles as possible to get that signal up into the brain to produce that systemic effect. However, all muscles that are getting exercise those muscles their cell-service receptors get turned on and everything else and so they're receptive to this systemic hormonal anabolic response that's coming down the line. So what happens is we make a point of we want to exercise the muscles so that we get that fatigue signal that had their blood flow impeded, but we also want to exercise other muscles that are involved in any of these exercises. Carl Lanore: But wait a minute, but wait a minute, but technically they do and just stay with me because I'm obviously not up on this, but when I used to use some form of KAATSU for my upper arms what I also found was that while the blood flow is being restricted in my biceps and triceps predominately and obviously the forearms because they're downstream. Carl Lanore: But the muscles upstream are also experiencing some form of occlusion in the way that the blood that normally passes through them is kind of being trapped backed-up It's kind of like look when you clog a drain nothing on either side of the clog works very well, so my pecs used to get a really good pump and my shoulders used to get a really good pump when I was focusing on my biceps and triceps. Dr. Stray-Gundersen: Yeah. You're absolutely right, your pecs and your deltoids and your shoulder muscles are all getting a really good influence, but their blood flow is just fine thank you very much. Dr. Stray-Gundersen: And so here's one of the things. So let's say that we're going to do a bench press or let's say we're going to try to do a pushup. Let's say it's a pushup, you're using your forearm muscles, you're using your biceps, mainly you're using your triceps, but you're also using your pecs. So the pecs their blood flows happy camper, but the triceps they're the weak spot because they're blood flow impeded and they're starting to fail and they're sending a signal to the brain saying, "Hey guys I'm failing. I need to have a better percentage of my maximal ability to go forward." And the brain then says, "Okay well we got to really whip that horse and get those pushups going so we'll send out a signal to all of the muscles involved in the activity to work harder." And so those pecs are getting the same kind of whip if you will that the triceps are and even though they don't really need it. So then you end up getting this exercise benefit for the pecs as well as the triceps and everything else. Carl Lanore: So the reality is in order to achieve the proper what's the word I'm looking for, not occlusion but, ah, um, isn't this funny I just forgot my own – I got lost. But the bottom line is that in order to get the proper affects from this you really to just be able to get high up on the thighs where they attach into the groin area and between the tri and the upper arms below the shoulder muscles, that's it, that's everything. So you don't have to worry about occluding pectoral muscles or anything else. Dr. Stray-Gundersen: Right. So point number one, get the bands in the right place. Point number two, modify the pressure and do little tests so that you have the proper amount of blood flow impediment and never occlude. Then point number three is use simple, easy weights, simple movements to get those muscles to fatigue and send that signal up into the brain that then releases the hormonal response. Dr. Stray-Gundersen: And it's really that safe and that simple if you do it that way and you know so you know there's tons of people that think that one's good, ten is better, well all that stuff is not the way to do KAATSU. Carl Lanore: Okay. So now we're going to take a commercial break and I have some questions I've always wanted to ask about certain supplements and their influence on the results of KAATSU and hopefully you'll have some opinions and perspectives on this. We're talking right now with Dr. James Stray-Gundersen and the website is KAATSU-global: K-A-A-T-S-U hyphen global.com. If you go there and you place an order, well first of all you get a free report there, number one, so go and get that, but if you do want to buy some of the bands and items they offer if you mention this radio show, Super Human Radio, you'll get a 10% discount. This is good through for 30 days, so it's October 12th today if you're listening to this show late, if it's 30 days after that that coupon code is no longer available. We're talking with Dr. James Stray-Gundersen. We're talking about KAATSU training. If you are a personal trainer and you want to add the certification and the equipment to your repertoire of offerings you need to go to KAATSU-global.com: K-A-A-T-S-U hyphen global.com. This is a very, very serious science here. This is not where you put some ropes or bands around your client's arm. The equipment gives read-back, it gives feedback and it explains what you're doing right, what you're doing wrong. It allows you to guide – you know and this is something really not just for the average person, but for those professionals out there who are bodybuilders who want to try to take their body to a different level that they just can't get with the type of training they're doing now. I have a feeling that KAATSU will open amazing opportunities for growth in those individuals. So real quick two topics I want to cover and then we can wrap it up with whatever else you want to talk about. Certain supplements seem to influence this phenomenon either in a positive or negative aspect I'm thinking. I don't know if this is true that's why I'm asking you. Beta-analine has been shown to quench hydrogen ions, allowing endurance athletes to train longer without the burn so to speak, the lactate buildup. Would that be a non-starter, a not a good supplement to use if you're looking to use KAATSU? Dr. Stray-Gundersen: No, I think beta-analine would be great. You know let's take nutrition as a kind of general topic. I know there's lot more here. But I think the way that nutrition, whatever nutrition the person is applying that KAATSU just amplifies the effect of this. So if the nutrition is intended to build big muscle then that's what's going to happen with the combination of the nutrition that's going in and the other training that's going on, as well as that KAATSU frosting if you will. If it's an endurance thing then that connotates a certain kind of diet and then also a certain kind of other training and then KAATSU can amplify those sorts of things. So for example it's been shown that muscle that gets built with kind of endurance-type training ends up having the characteristics of that kind of muscle all the time. You know the athletes don't necessarily gain any weight. In sports where you don't want to gain weight you can use KAATSU in a way that combined with your nutrition and your exercise such that you don't, you don't gain weight. Where on the other hand bodybuilders or other strength kind of athletes they want to gain weight, so then their nutrition dictates kind of the way that this goes. Now one of the things back to beta-analine specifically just the idea that you have good intracellular buffers is still a good thing, it's just mean that the degree of impeding of blood flow needs to be a little bit greater than it otherwise would be. This is where we see these kind of things. So after you get done with your KAATSU session and you've done let's say three to five different exercises and you've gotten that failure signal at least in the third set of each one of those exercises, then in retrospect you know you did a good job. Whether you have beta-analine onboard, whether you don't, whether you are using creatinine or all those sorts of things they just set the stage for the muscle to adapt in a better way to a stronger stimulus. Carl Lanore: Okay good because then you answered the question about a nitric oxide donor as well like you know L-arginine or something like that. Carl Lanore: Okay. What about strength? Is there any evidence that KAATSU training actually effects neuromuscular adaptation in the same way that handling heavy weight does? Dr. Stray-Gundersen: Well I'd kind of answer it this way, you know one of the things is you get increases in strength with KAATSU within two weeks. I would say that most people think that that's just because we've gotten better motor activation, better coordination and we really haven't done anything to the muscle itself. But that's not the case. We do get those enhancements of the motor coordination and all that kind of stuff, but we're still getting protein building going on in the muscle and as I was kind of alluding to earlier that because we haven't done the damage we don't have to dig ourselves out of this hole that takes you know four-to-six weeks. Dr. Stray-Gundersen: We can just start going right from get-go. So I would say that the degree of skill acquisition and all those sort of things is the same with KAATSU as it is with other sorts of sports or other sorts of weightlifting. Now let me illustrate one thing is one of the things that I love doing with all of my athletes is I ask them to put the KAATSU bands on and then they have to try to do some skill activity that they may have been doing. For example juggling a soccer ball or throwing a baseball or hitting a baseball, all these things that are highly technically oriented and with the KAATSU bands on at the right pressures they're just horrible at it. That does a couple of things. One is these are already well accomplished people and they don't like not being good at what they're sport is and so it forces them to focus on the very specific motor tasks that are involved. Then because they renewed their focus on these activities, plus their muscles are getting more fatigued than they otherwise would they get a really robust response. And very shortly they're on one hand juggling soccer balls really well again with the KAATSU bands on and then on the pitch they're even better than they were before. Carl Lanore: And so then when they take the bands off since they've had to focus more and get more neuromuscular inroads and control with the bands on when they take them off they're actually even better than they were before. Dr. Stray-Gundersen: Exactly. So here's the thing, one of the things that is a critical component of all sports is when fatigue sets in you still have to do things and in exactly the right way whether that's catch that football or hit that jump shot or score that goal, all these things are very critical, technical things that are not done well when the individual is fatigued. KAATSU teaches you to operate under those conditions of fatigue so that you then do those things better when you don't have the KAATSU bands on. Carl Lanore: We only have a few minutes. Are there any contraindications that someone should not get into KAATSU? Like let's say they've been diagnosed with peripheral artery disease and they don't want to put bands on their lower legs am I right about that or no? Dr. Stray-Gundersen: The short answer is there's pretty much no contraindications to KAATSU. There's a couple of situations where we take extra care. One example for example is a woman who's had breast cancer and has had the lymph nodes in her armpit removed or the lymph nodes have been radiated, which produces a situation where generally they're advised not to put blood pressure cuffs on their arms or get blood drawn on that side. We similarly with an abundance of caution try not to put the bands on that arm. But the other three extremities they're still good to go for KAATSU. Dr. Stray-Gundersen: That ends up being just fine. Carl Lanore: Oh yeah because there's actually a cross-education. We know that if you train one leg, the other leg gets something out of it anyway, so there's probably some real benefits to that. Dr. Stray-Gundersen: Exactly. So you know there are things and this is part of the educational process, there are things where we have to modify exactly what we do and we don't do, but suffice it to say that there's a way to KAATSU everybody in a safe manner. So for example you were talking about the peripheral artery disease in let's say a senior for example. There we're not going to use very high pressures, but we don't need too because we can end-up getting that KAATSU effect with a combination of low pressures and easy exercises that work for them and doing so such that we don't damage any arteries that are already diseased. Carl Lanore: I have to believe that the hemodynamic changes would actually be beneficial to arteries because we know that heavy load-bearing exercise over long periods of time actually makes arteries and veins more resilient, more elastic, and improves intima, thickness, and function. So I got to believe that allowing them to achieve that level of let's say almost what occurs in a Valsalva-type of a maneuver, achieve that kind of blood vascular pressure changes, but without doing a lot of strenuous work has to be beneficial to them. Dr. Stray-Gundersen: Absolutely. Again this gets back to that key to KAATSU which is when it's done properly there's low loads involved. You don't have to go to the extremes that you normally have to go to to get the effects to happen. Carl Lanore: Yeah. Listen we've run out of time. This is a fantastic interview. We're happy to have Dr. Gundersen back on the air. If you have questions that we didn't cover please e-mail them to onair@superhumanradio.com and I promise we'll have him back on and cover it at a later time. Whether you are an end user or you are a personal trainer you must go to that website. Download the free report, but more importantly checkout the equipment, get certified and offer KAATSU training to your clients, it's a great idea. Listen, thanks for being on the show today Dr. Gundersen. Dr. Stray-Gundersen: Oh, you're more than welcome.